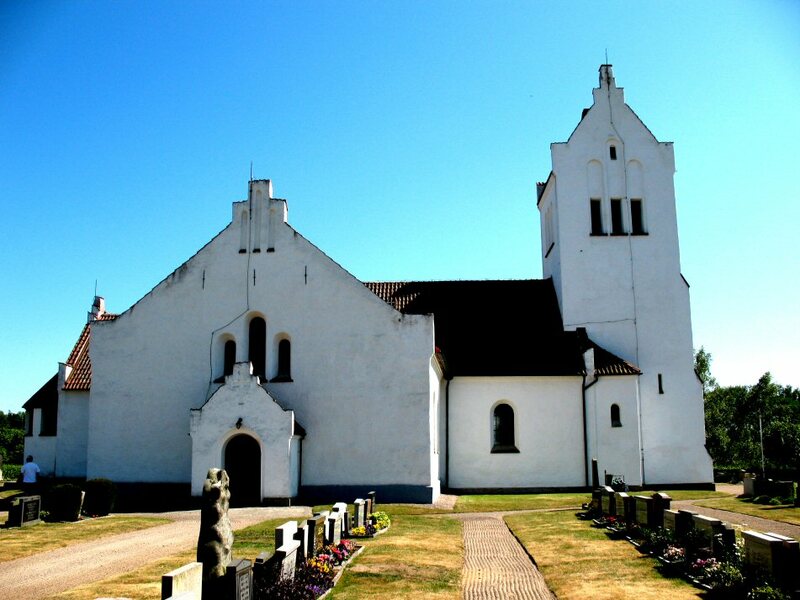 The church in Verum where Agnetha and Björn got married in 1971. 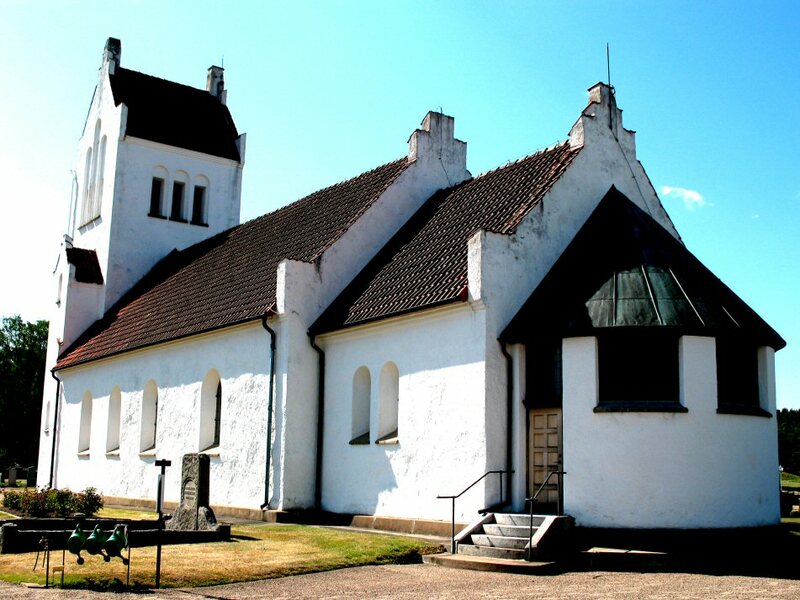 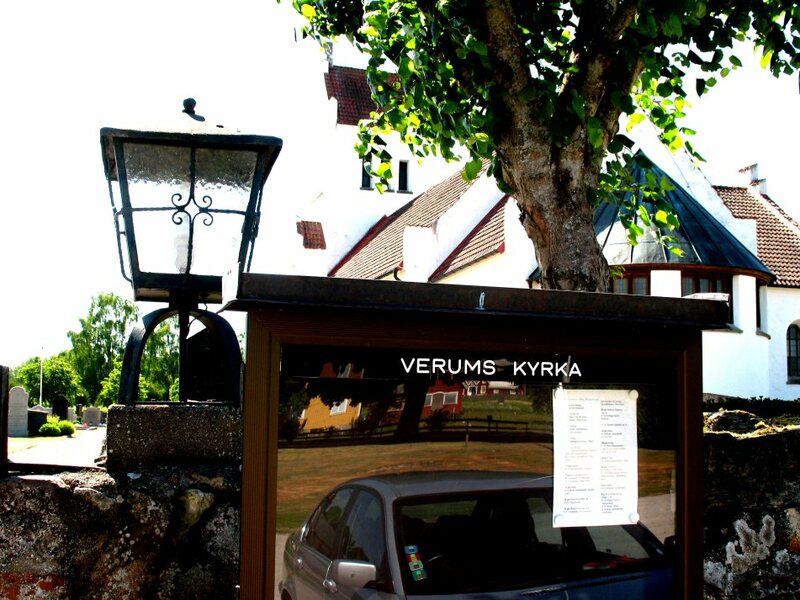 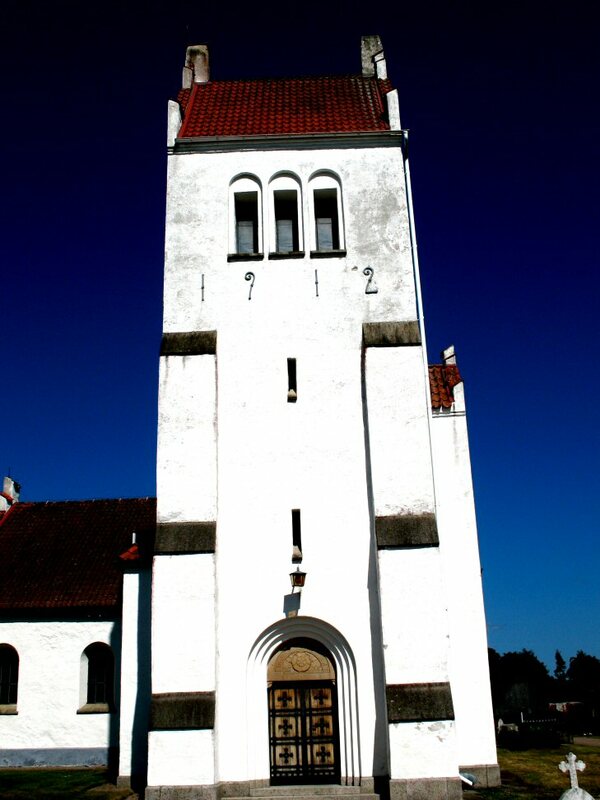 The church is situated about 15 kilometers from the route E4 (in height with the town of Markaryd) when you travel by car from Helsingborg/Malmö to Stockholm. 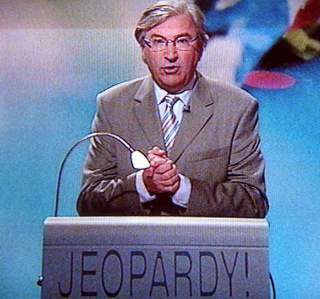 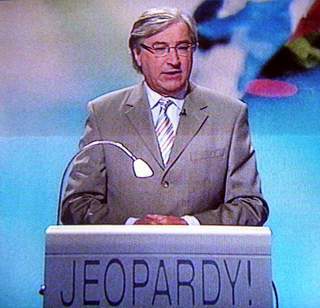 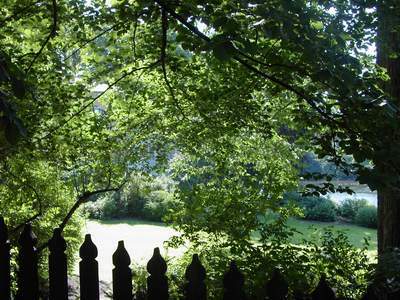 (The photos from June 2008). 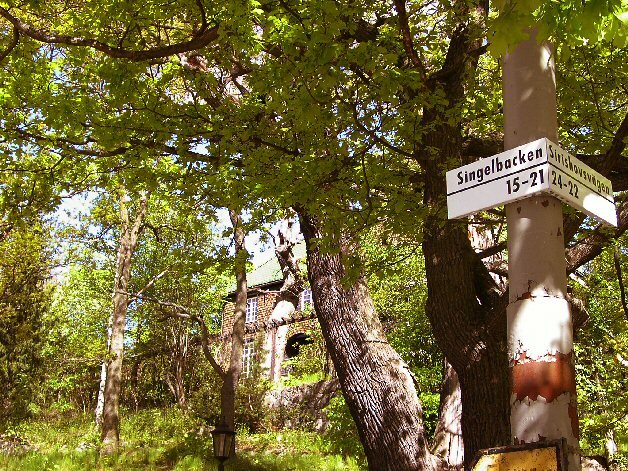 Ekerö island is well known for many of ABBA fans. 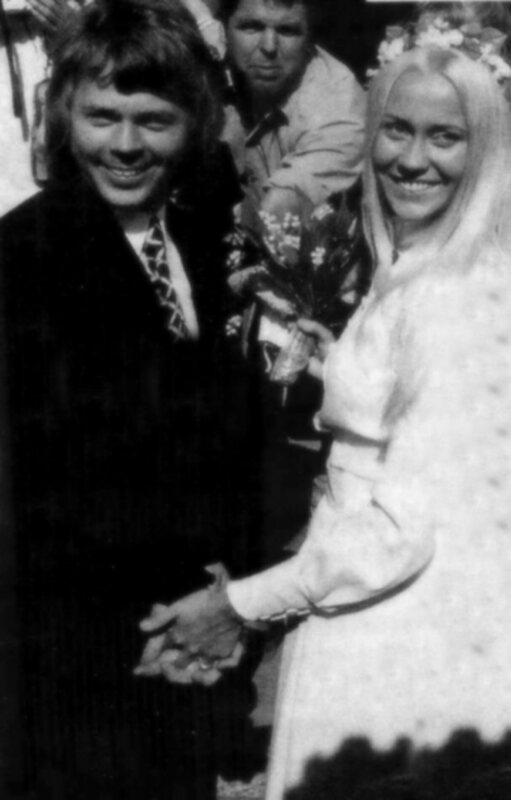 There lives Agnetha and nowadays also Linda with her family. 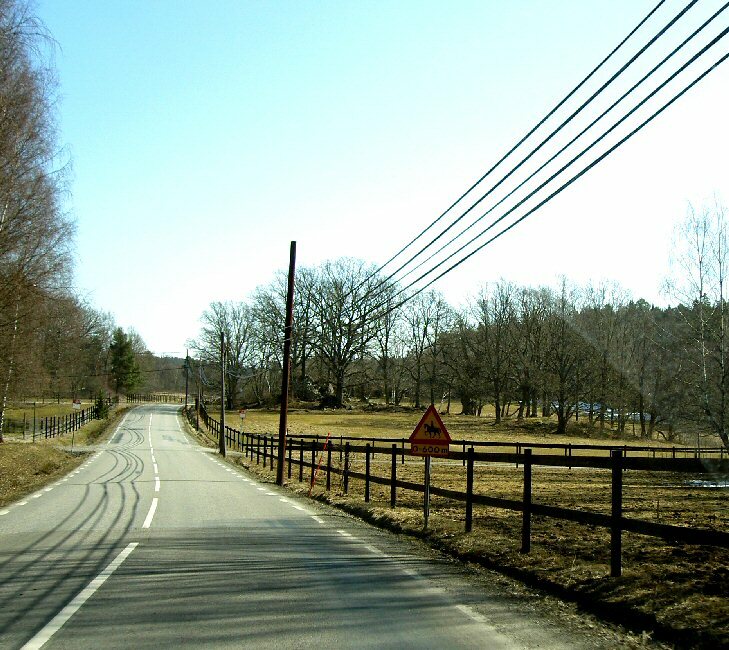 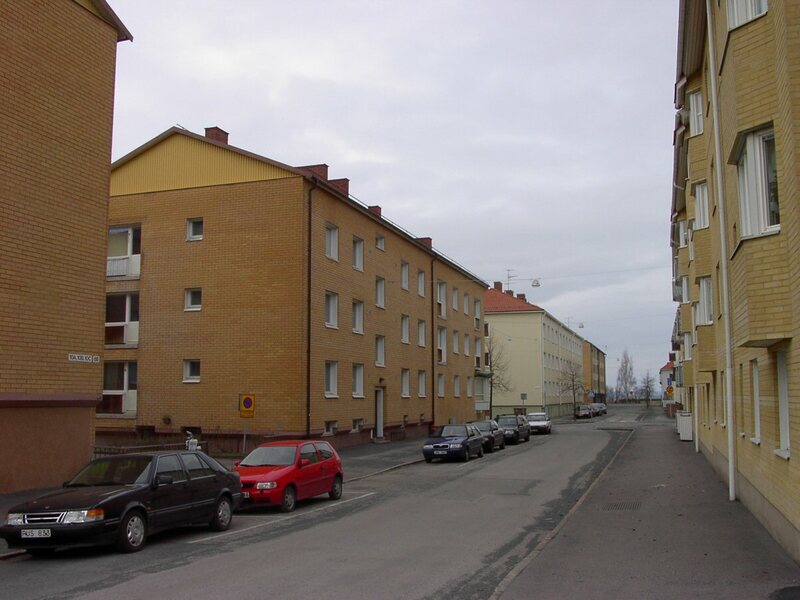 The suburb of Vällingby in the north-west Stockholm is the place where Benny grew up. 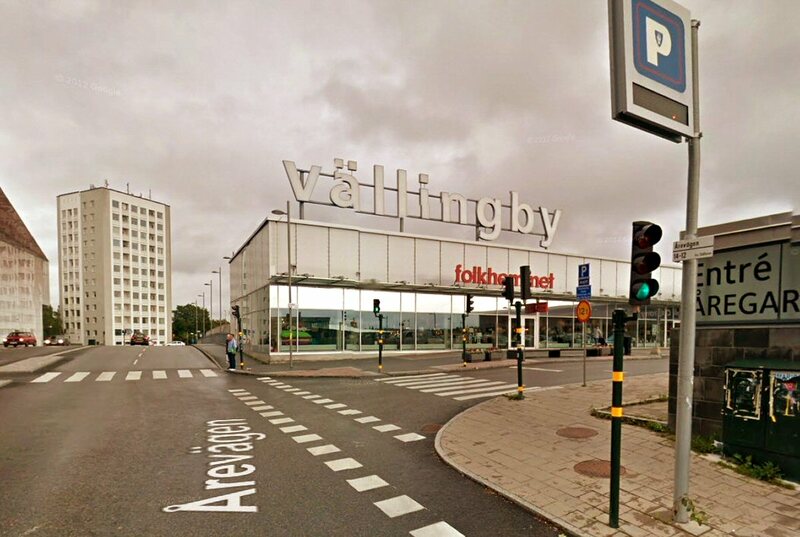 Here are some pics from Vällingby. 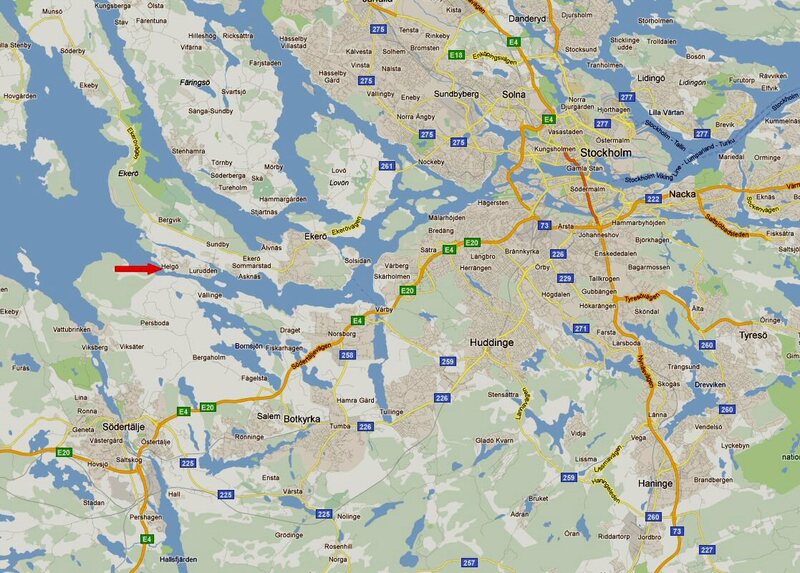 Access by metro, green line to Vällingby. 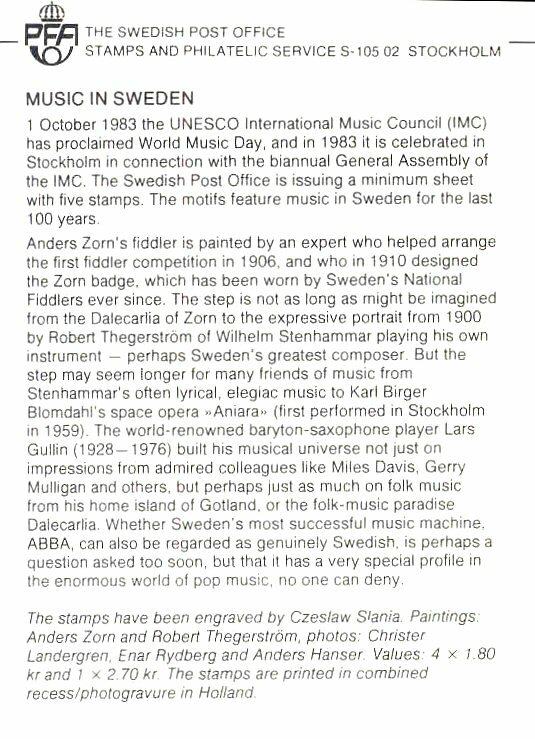 This is a related thing. 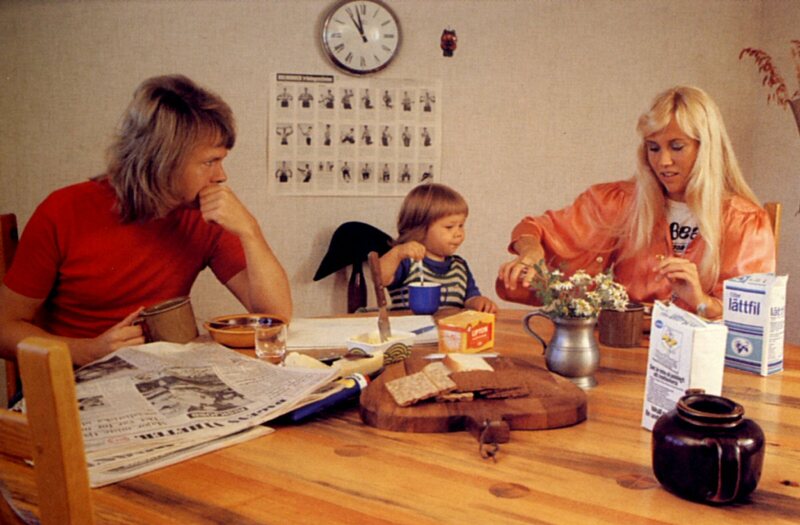 The clock on the wall at Agnetha's and Björn's place in early 70s is called Angsby design and made in Sweden. 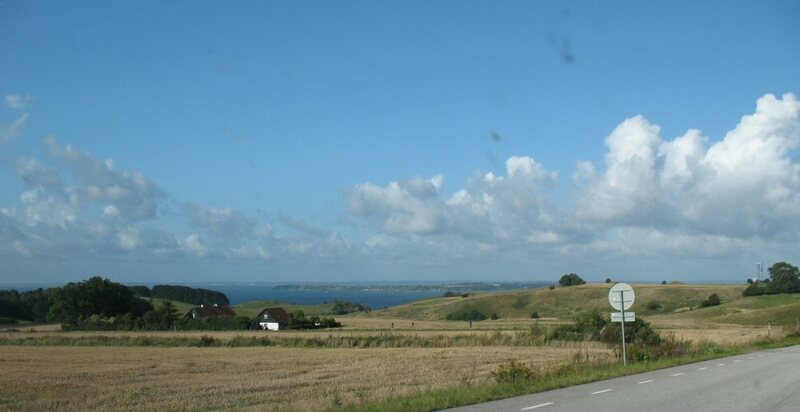 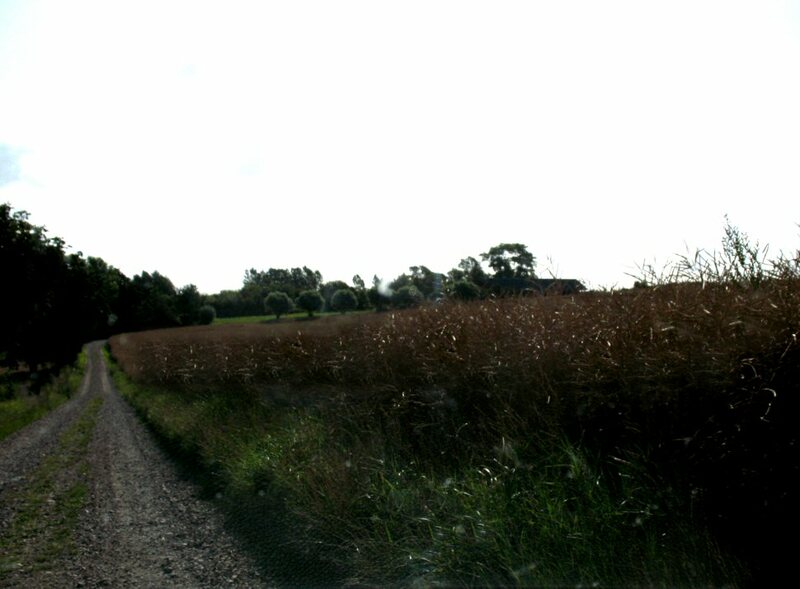 Benny's house in Hyby Hage outside the town of Svedala in Scania in southern Sweden - the lanscape Skåne. 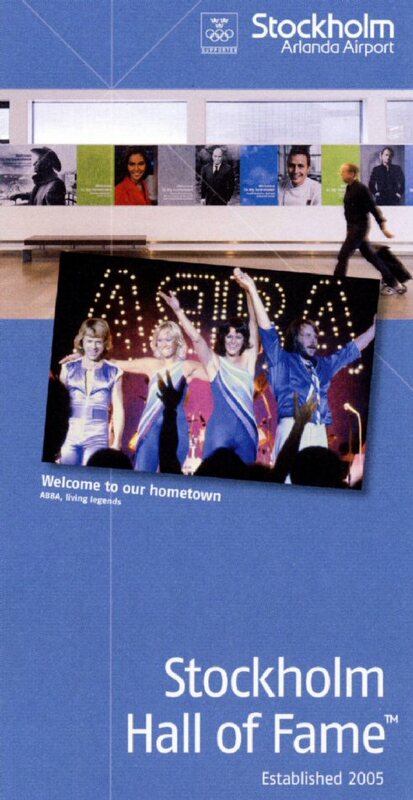 Jönköping - a well-known city for all ABBA fans. 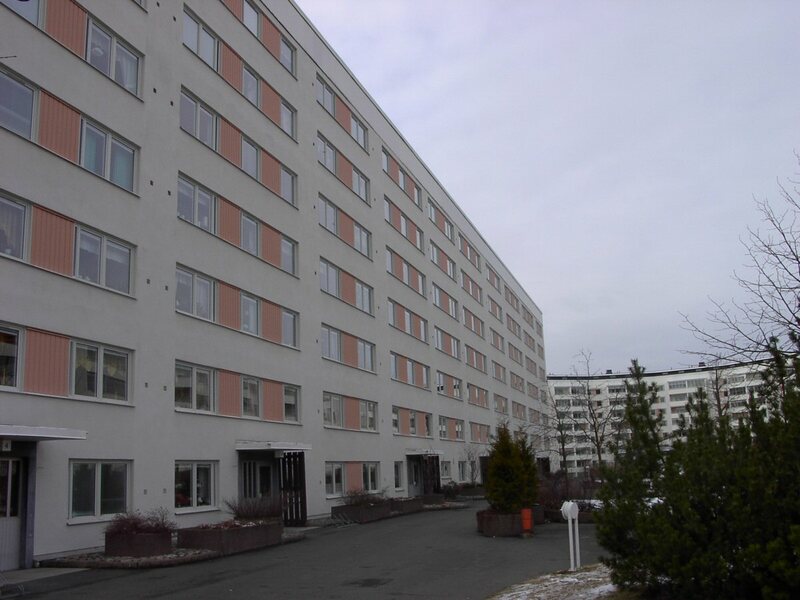 Agneta Fältskog was born here in 1950. 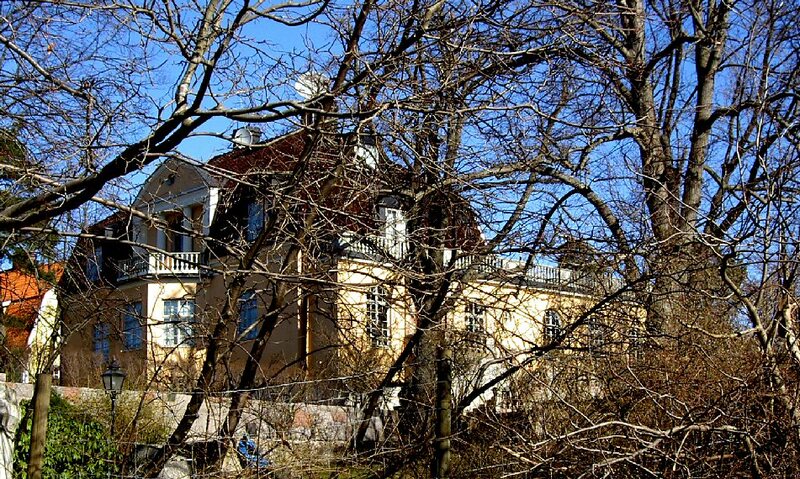 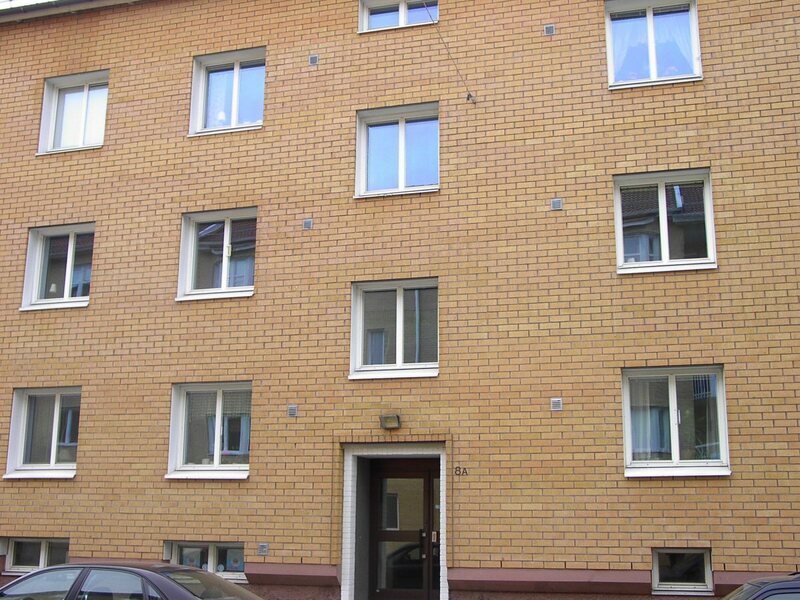 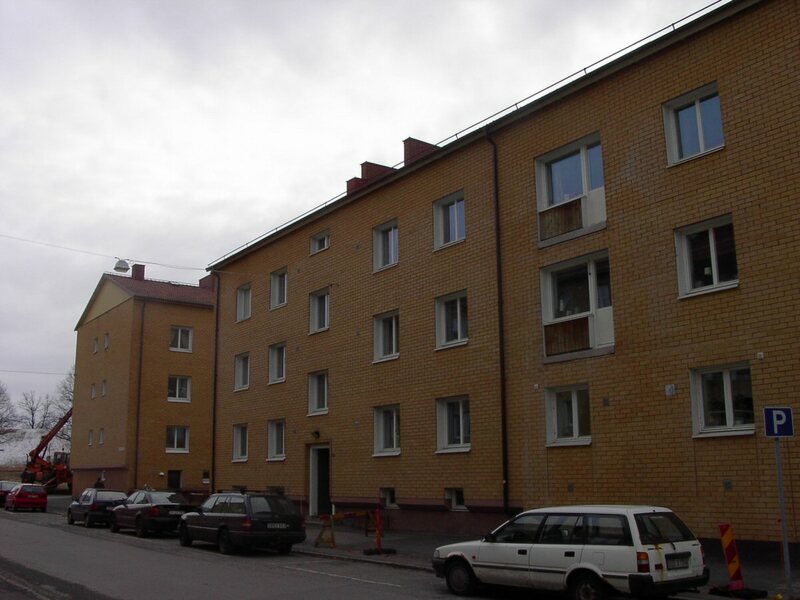 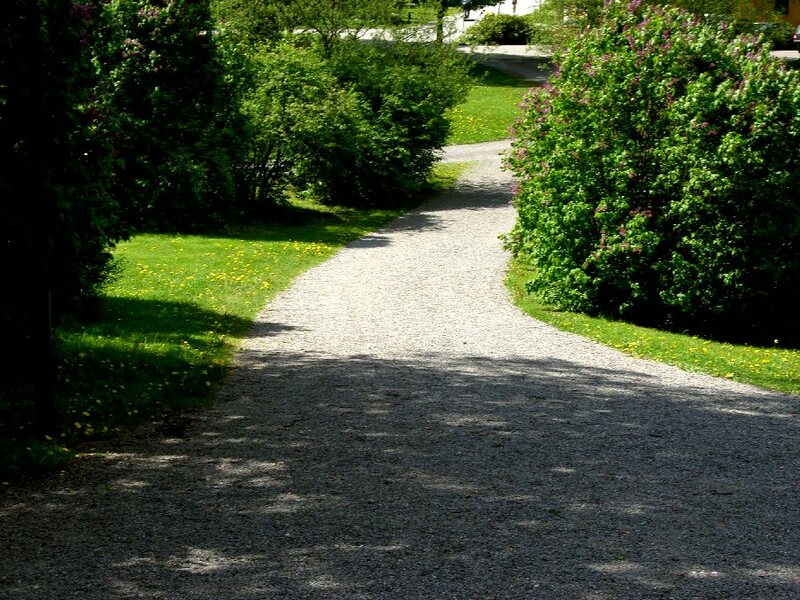 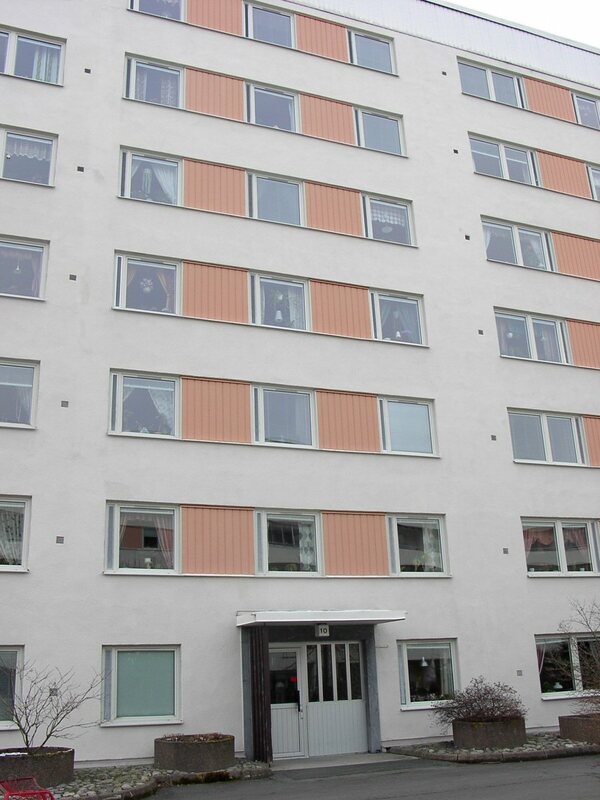 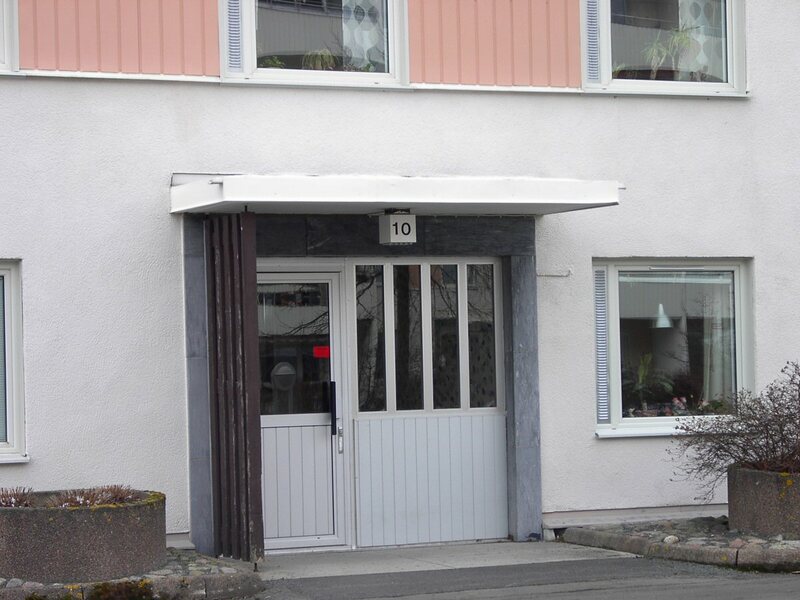 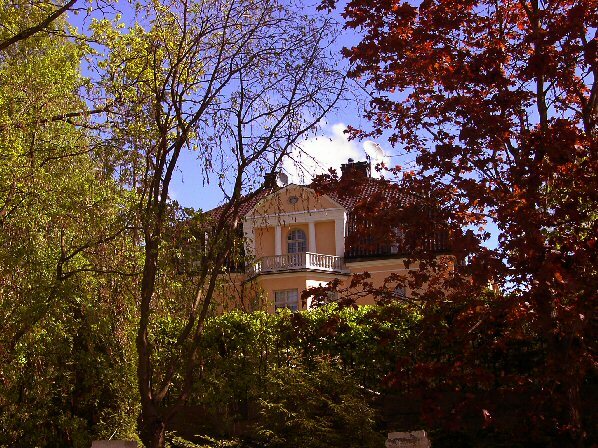 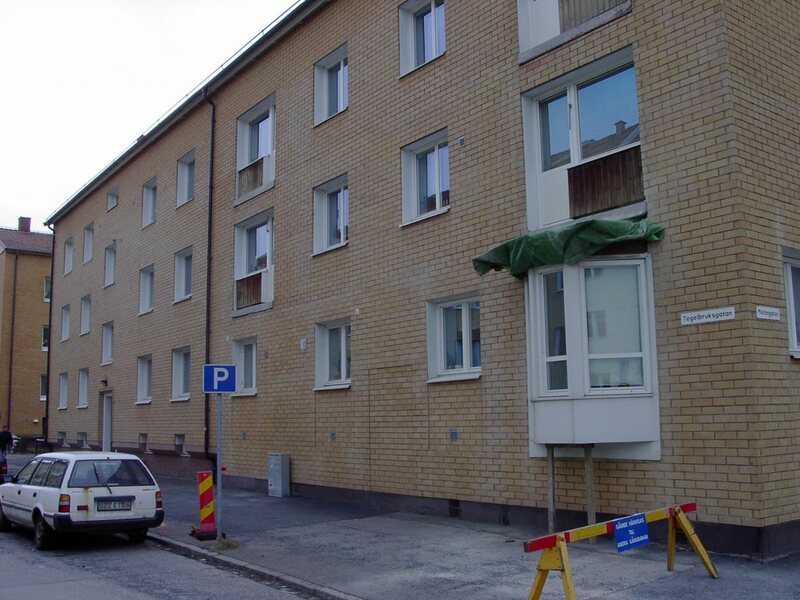 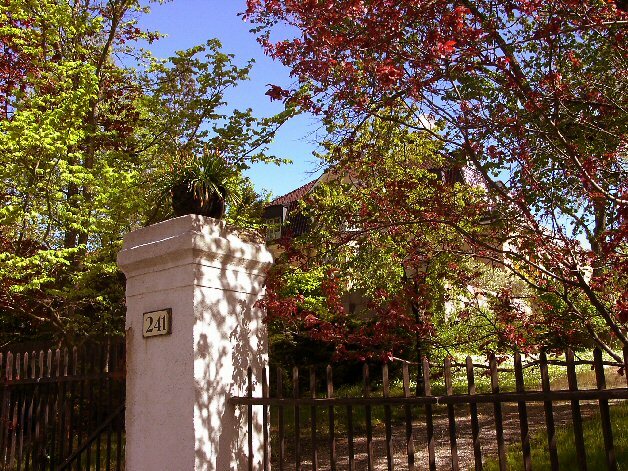 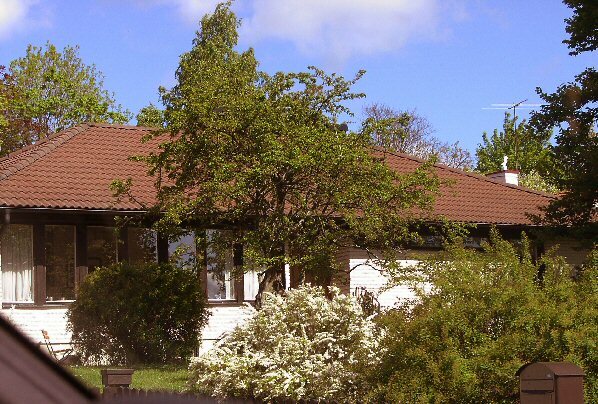 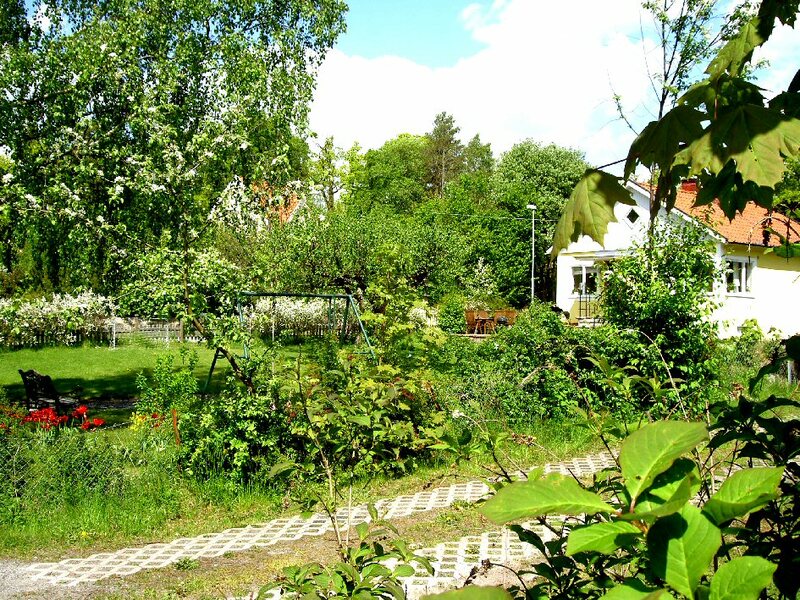 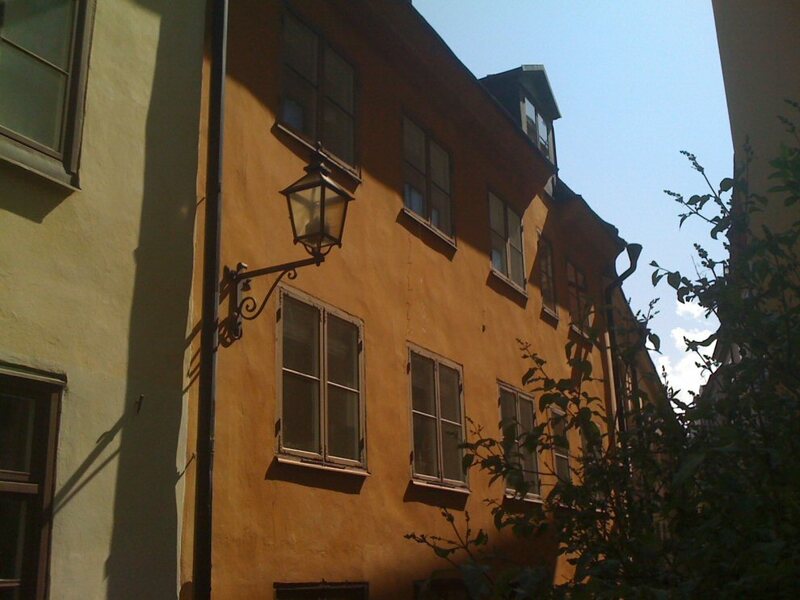 Agnetha's family house is situated in the Eastern part of the city in Tegelbruksgatan 8 a. 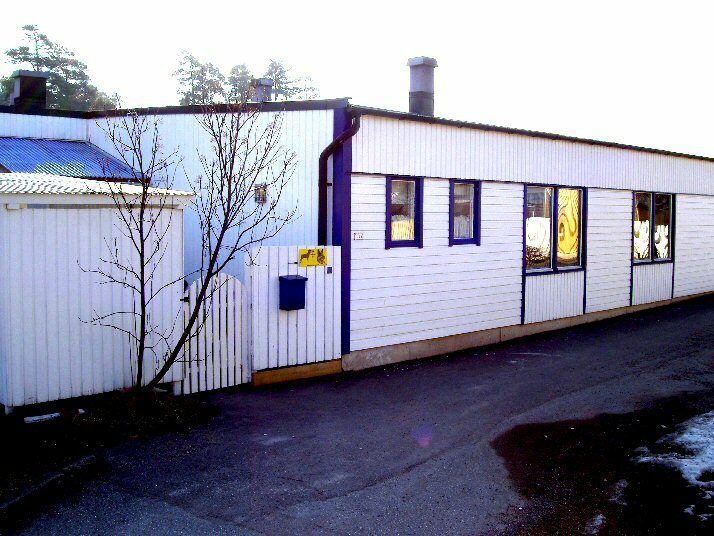 The house Agnetha lived in as a young girl with her parents. 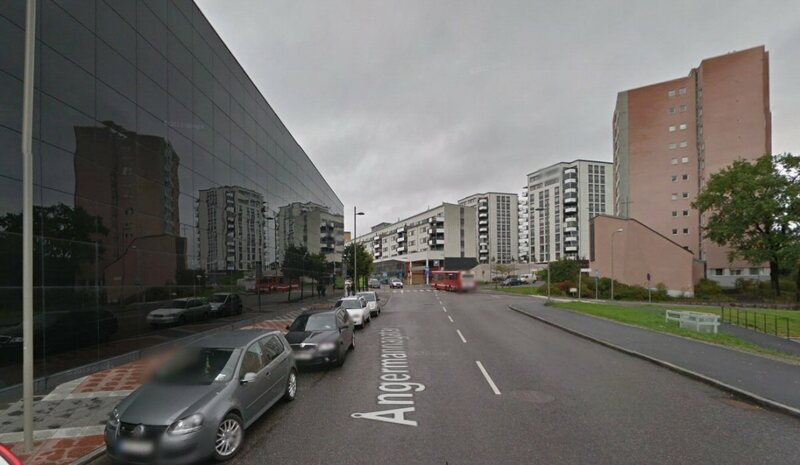 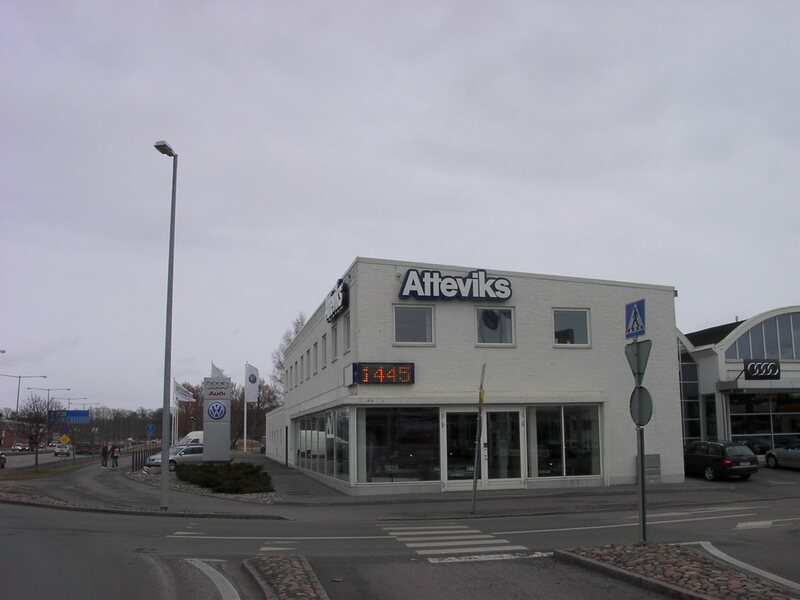 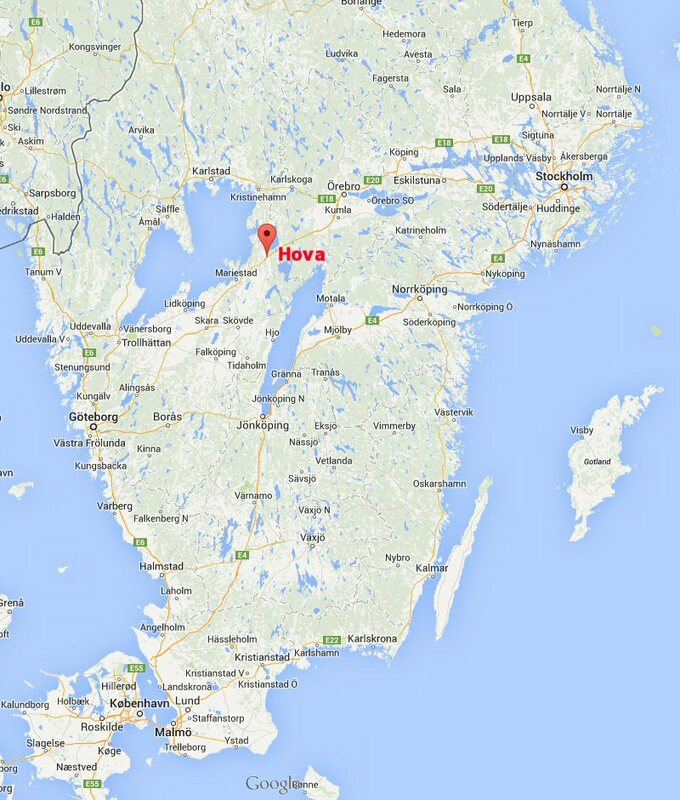 Agnetha moved from her family house probably in the beginning of 1969 to a new address. 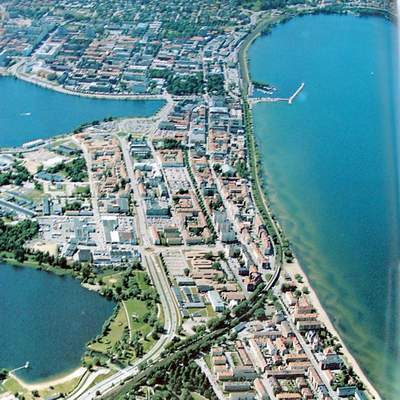 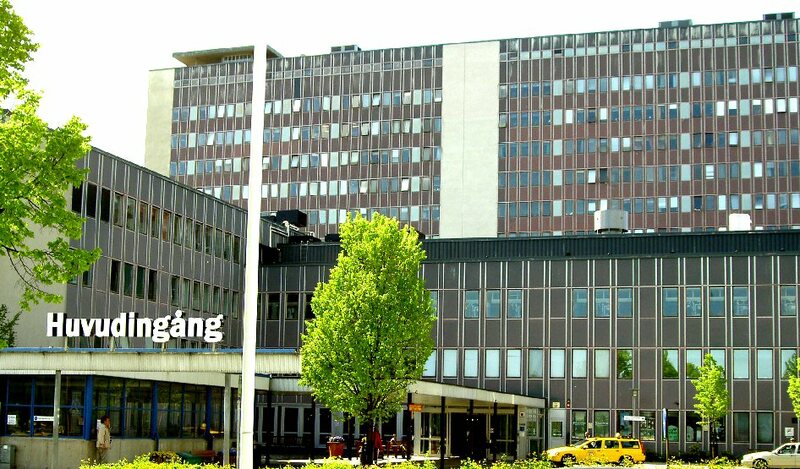 In the summer of 1969 she was officially registered in the Population Register in Bokgatan 10 in Jönköping. 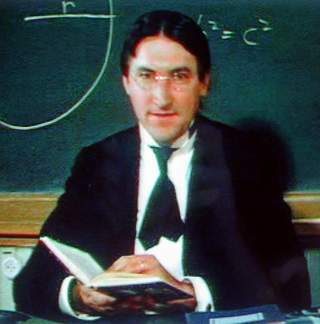 An ABBA related person can be possibly this man - Magnus Härenstam the actor playing the teacher in the famous video "When I Kissed The Teacher". 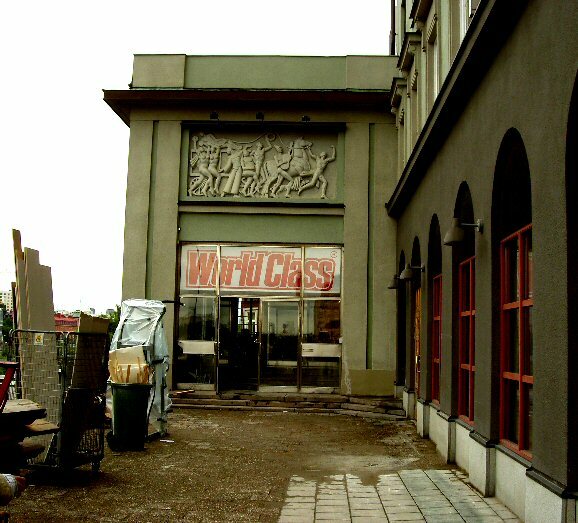 Magnus passed away in 2015. 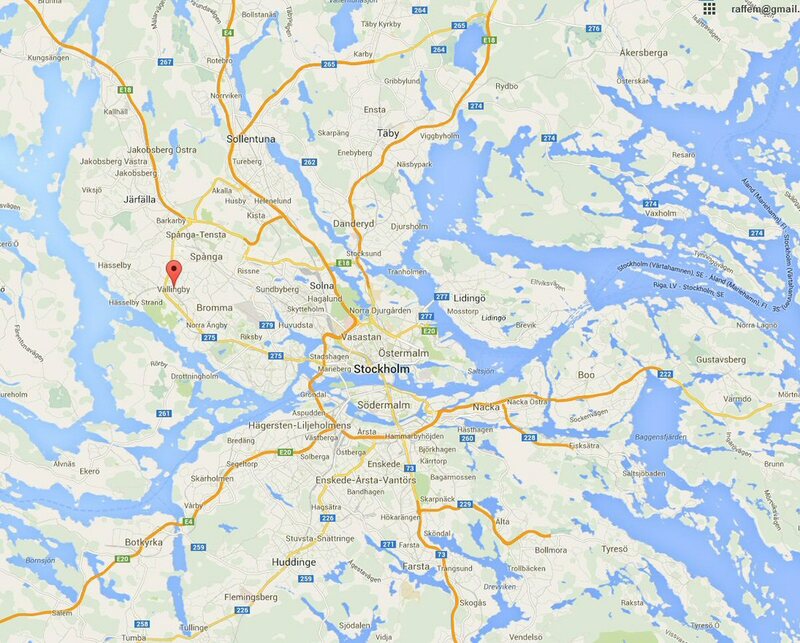 Benny lives with his family in Stockholm not far away from the TV tower (Kaknästornet). 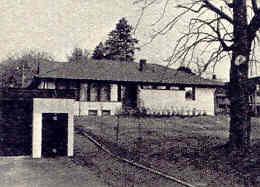 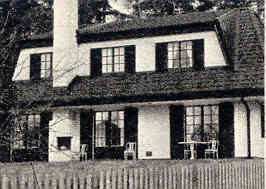 The house is called "Villa Lido". 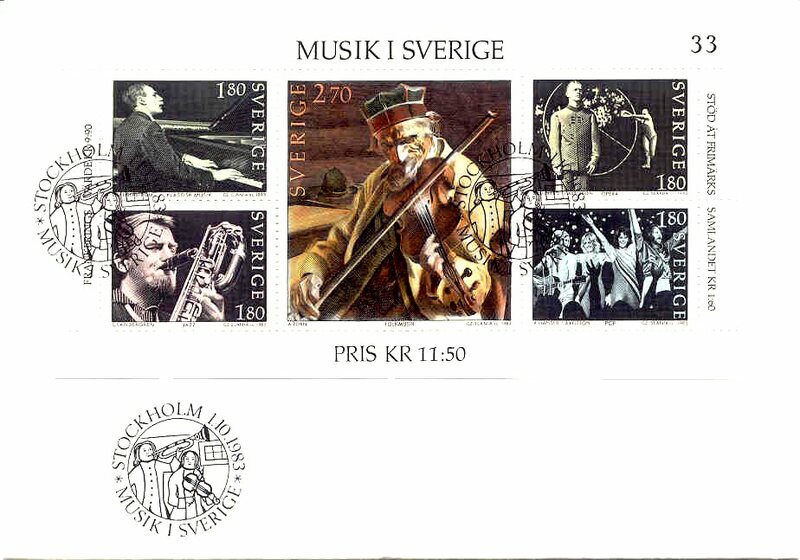 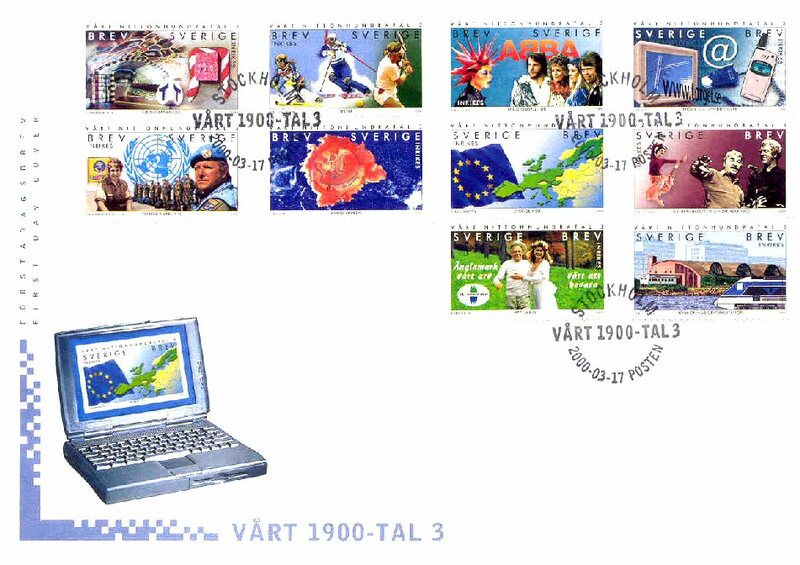 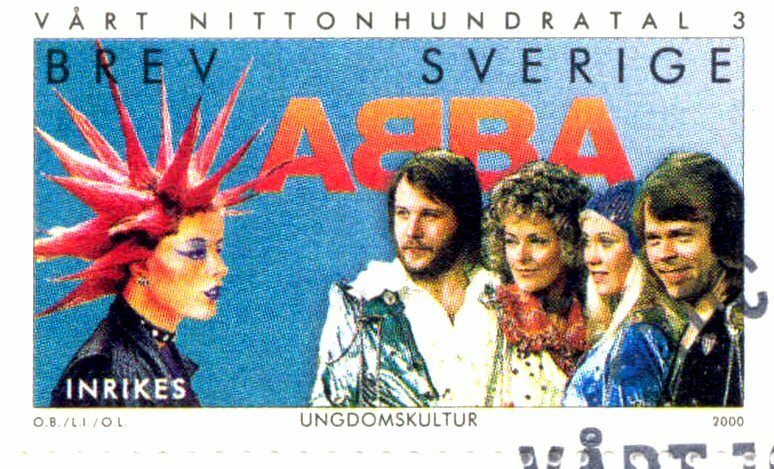 Swedish post issued ABBA stamps in 1983 and 2000. 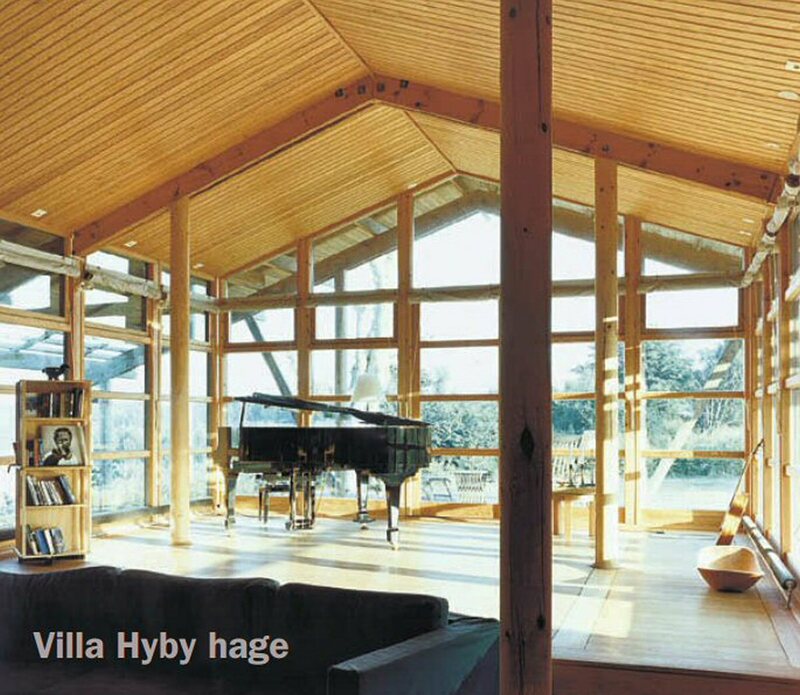 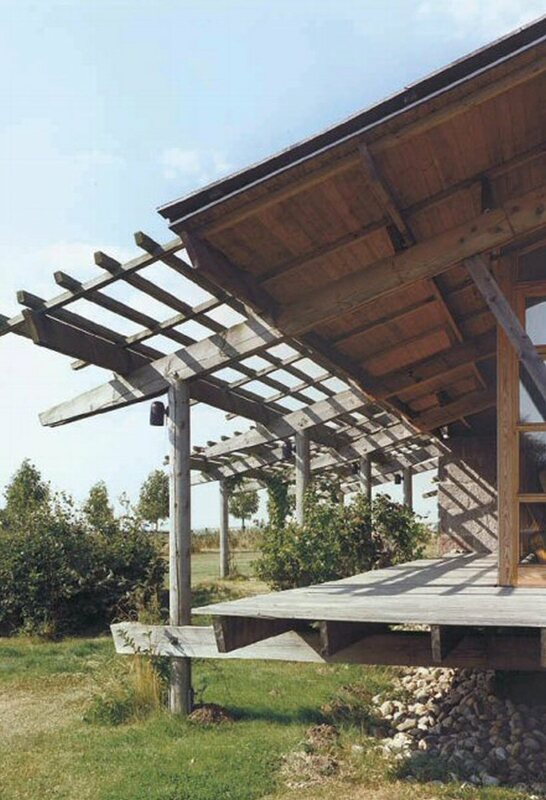 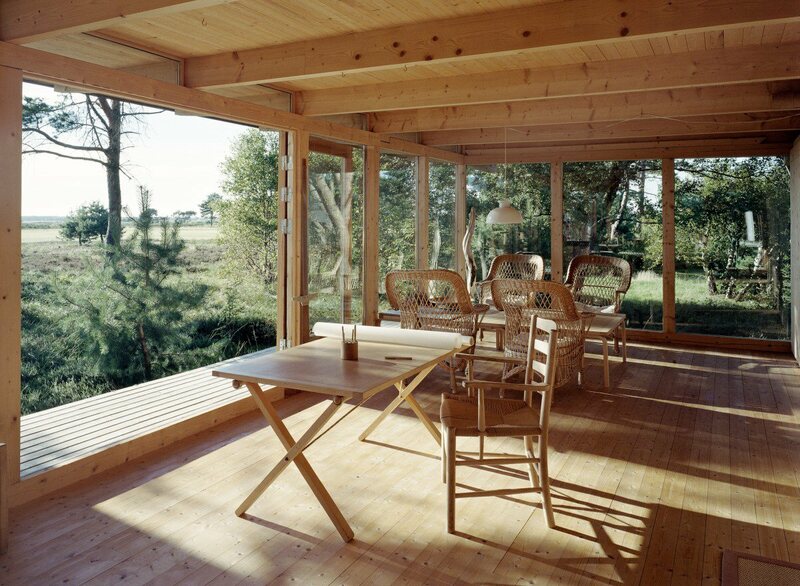 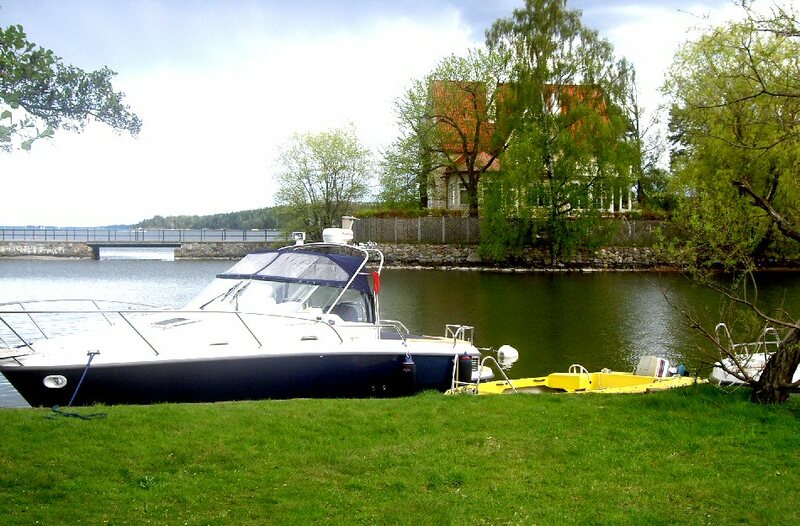 Björn's house is beautifully situated on a little island in Stocksund north of Stockholm. 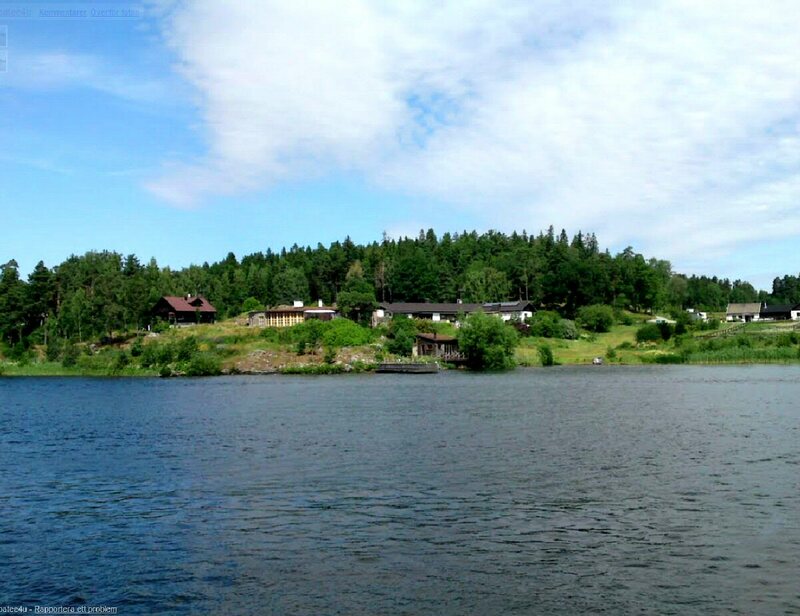 The famous summer cottage where Benny & Björn composed a lot of hits like "Fernando", "Dancing Queen" and "Thank You For The Music" is situated on the summer island (still belonging to Björn) Viggsö in the Stockholm archipelago. 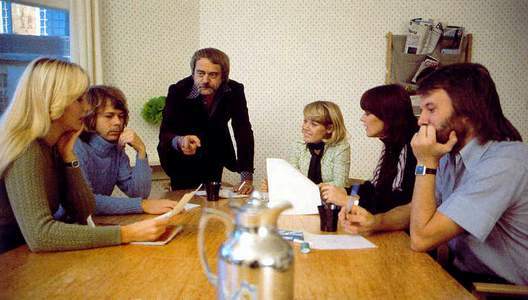 The group was filmed in the cottage for the TV special 1976 "ABBA Dabba Do" and for ABBA The Movie. 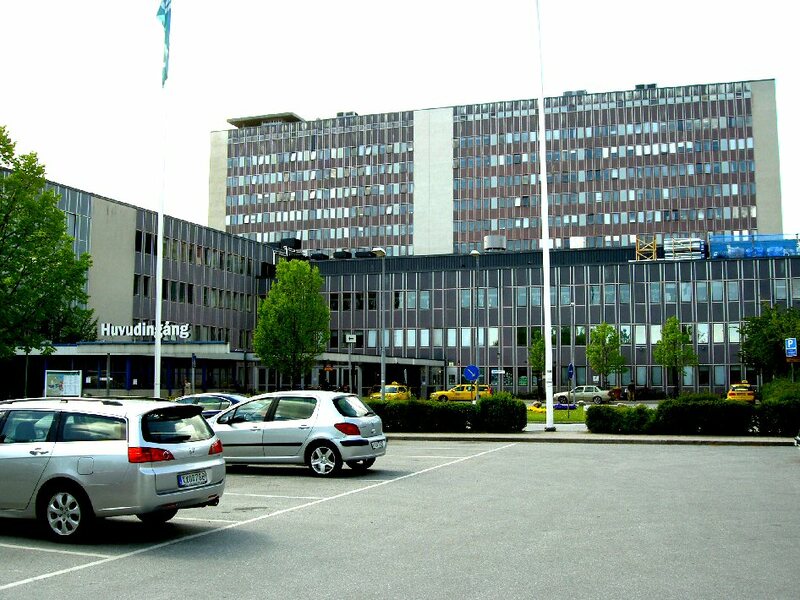 Agnetha gave birth to both Linda in 1973 and Christian in 1977 at the Danderyds sjukhus (Danderyd hospital) in Danderyd outside Stockholm. 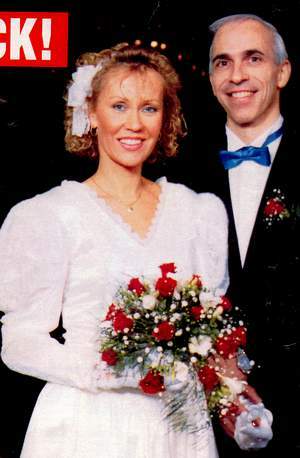 Anni-Frid moved from Sweden in 1982. 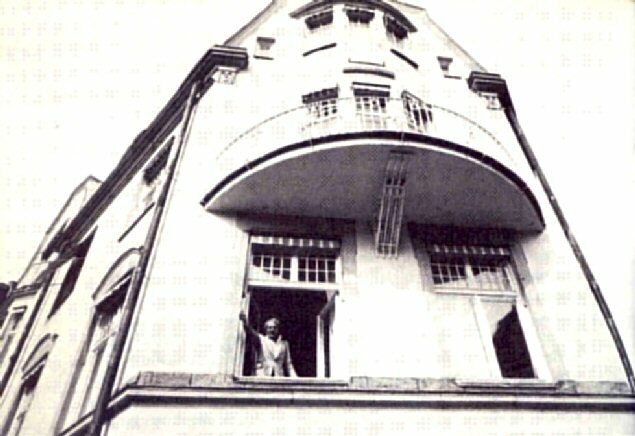 Since then she has lived in Great Britain, France and finally she found her home in Switzerland. 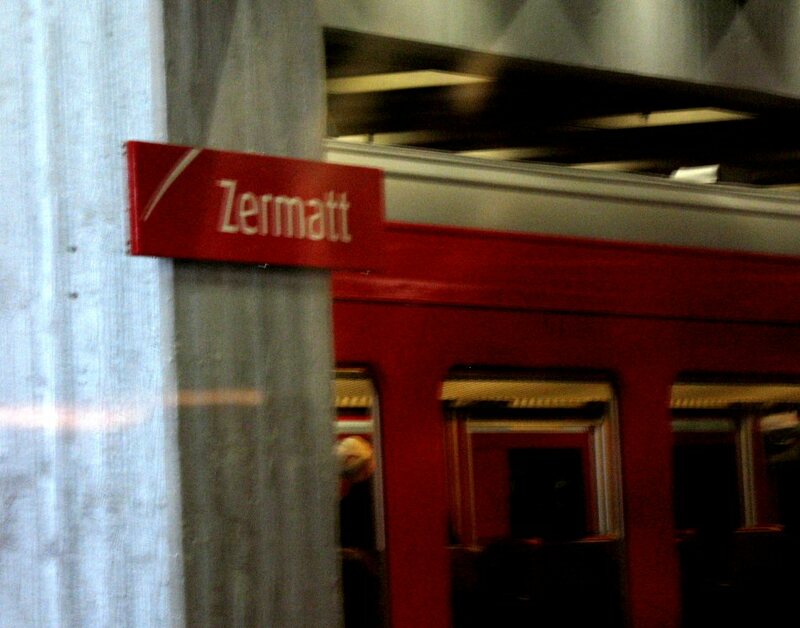 She owns an appartment in Zermatt in Switzerland. 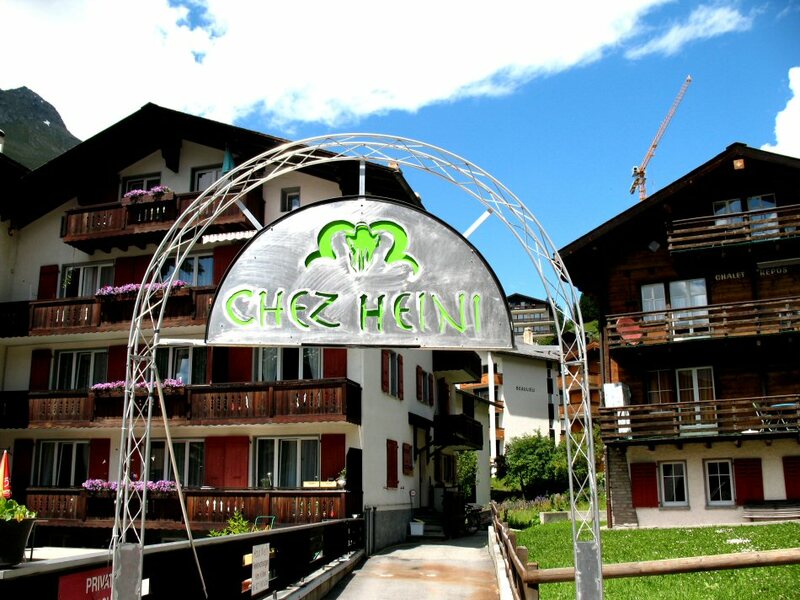 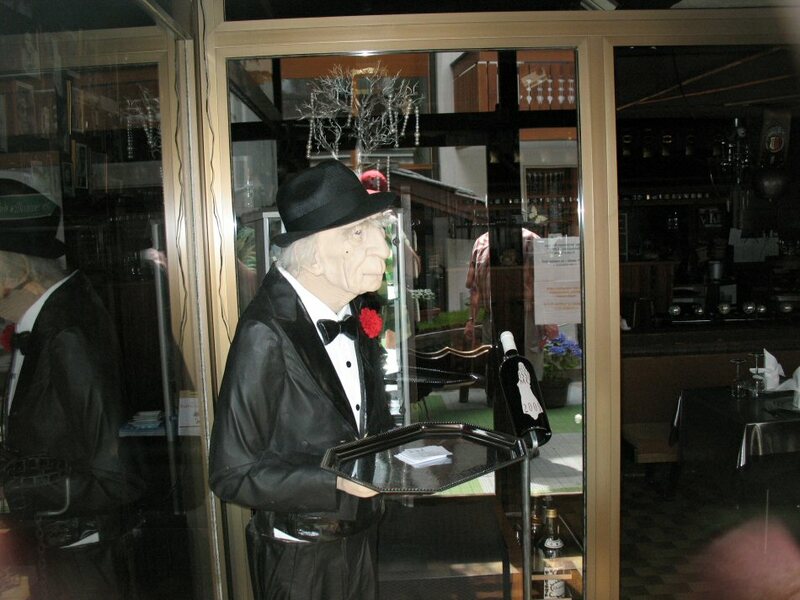 In the restaurant "Chez Heini" owned by Dan Daniell she meets her friends and has a dinner from time to time. 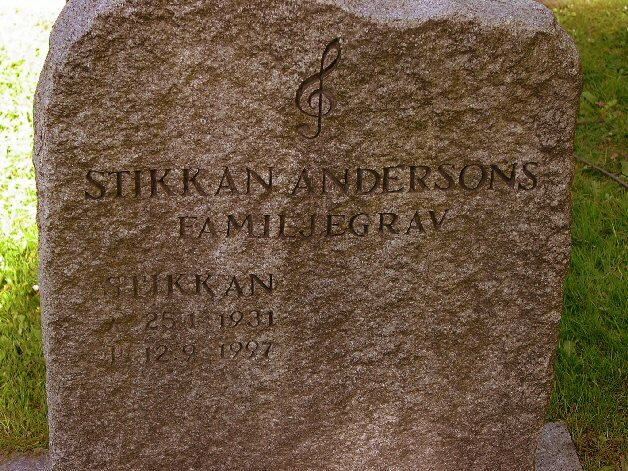 The monument of Stikkan Anderson, ABBA's manager was raised in his hometown Hova. 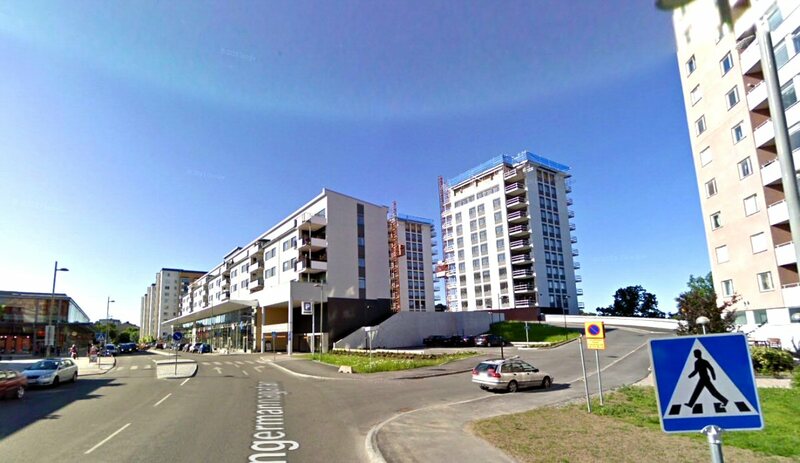 When you come to Hova you can see a bus stop and then a parking on the left side. 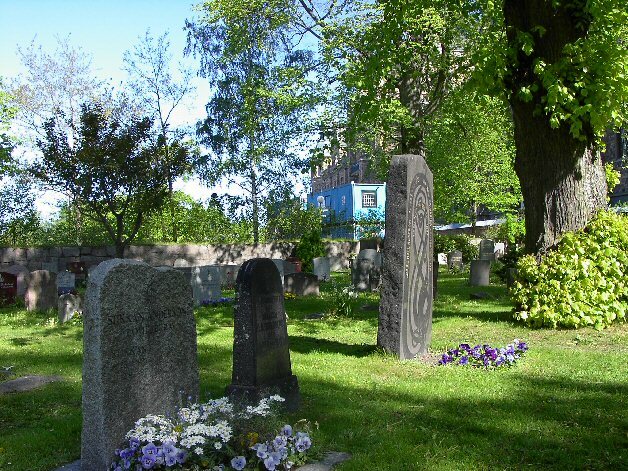 You find the monument there as well. 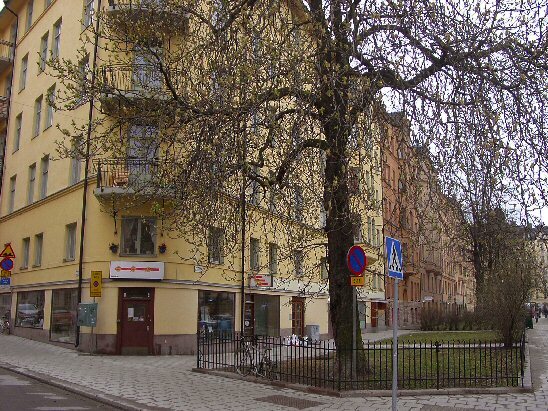 If you continue about 20 meters on the same side of the street you reach the commune house and some ABBA memorabilia in the show-window. 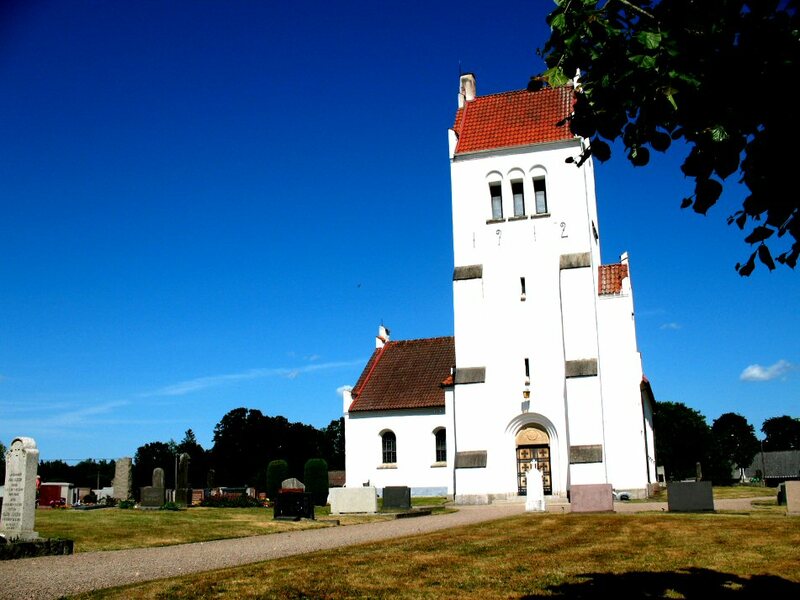 In this beautiful church on the island of Ekerö Agnetha Fältskog married Tomas Sonnenfeld in December 1990. 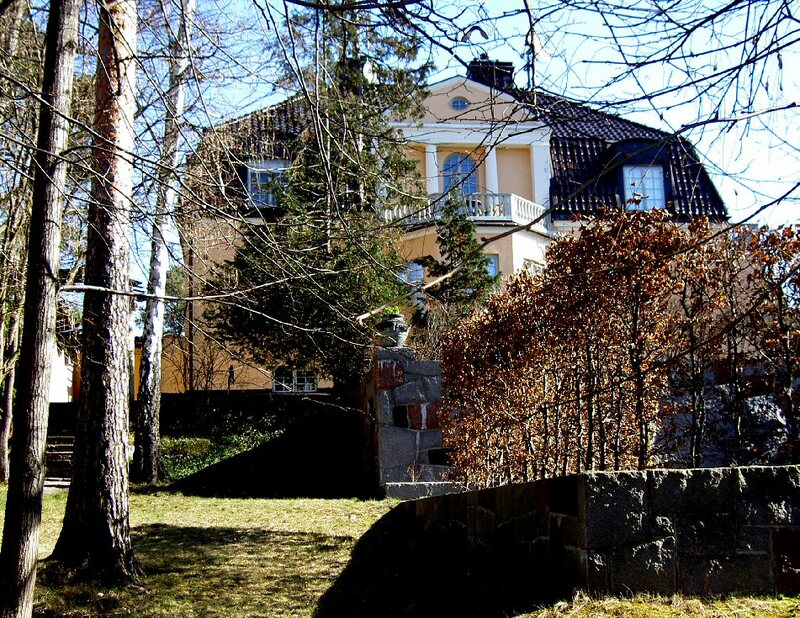 Benny and Anni-Frid moved from their flat in the Old Town in Stockholm to a giant house in Södra Kungsvägen in Lidingö in 1977. 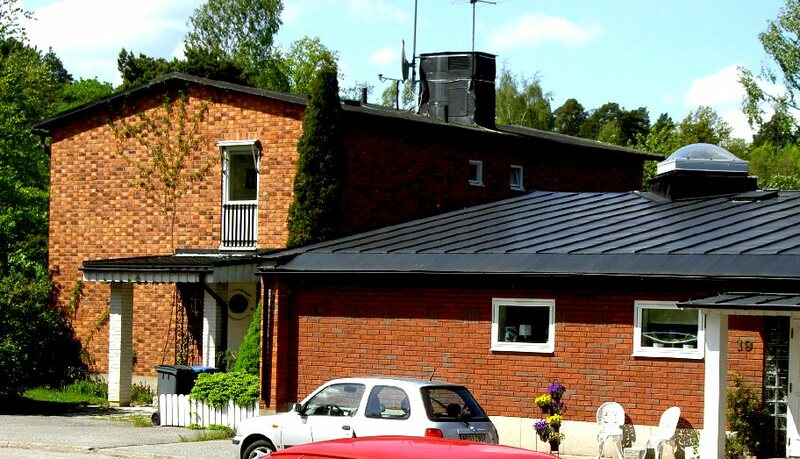 They lived there until their divorce in 1981. 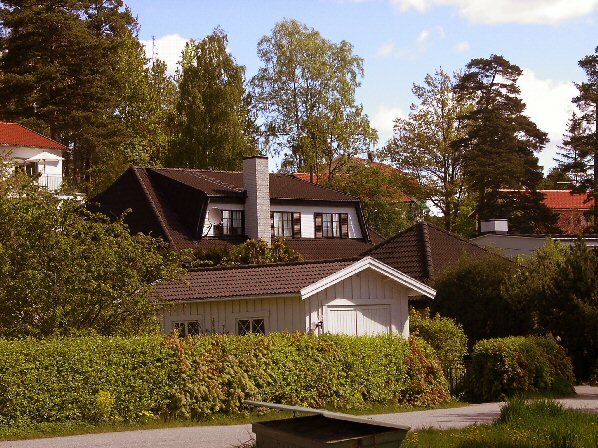 Agnetha & Björn lived together in the house in Trädgårdsvägen in Lidingö until 1979. 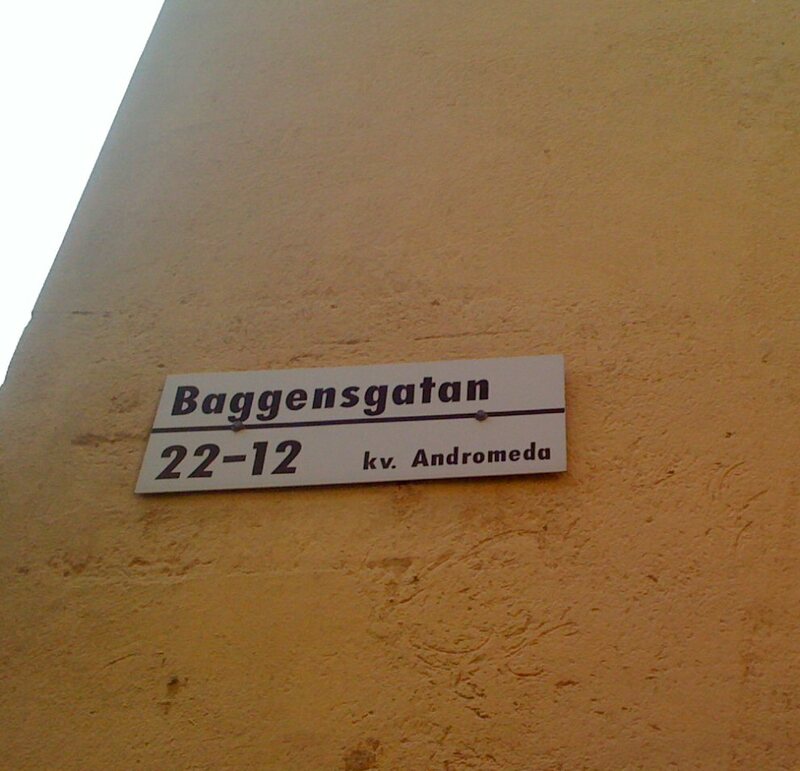 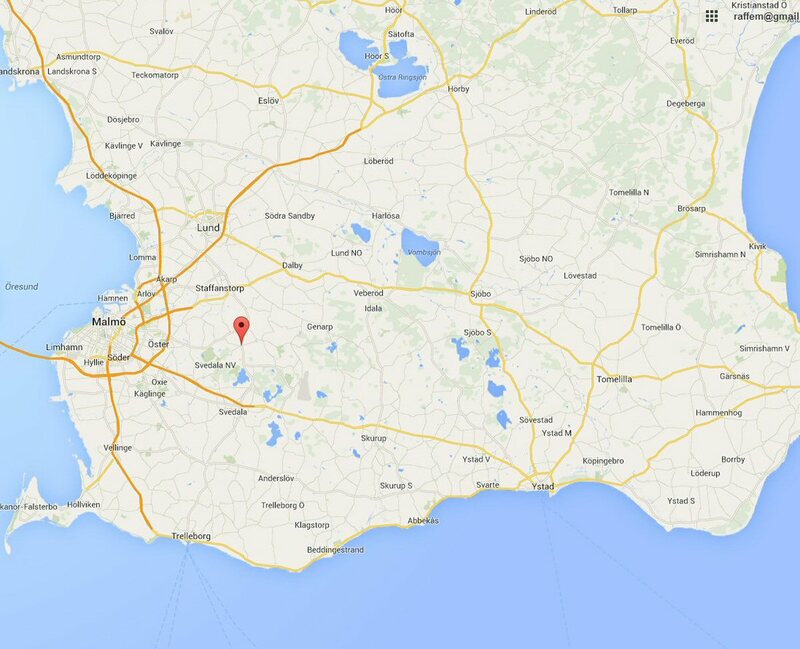 After the divorce Agnetha moved to Jupitervägen (about 10 minutes to go). 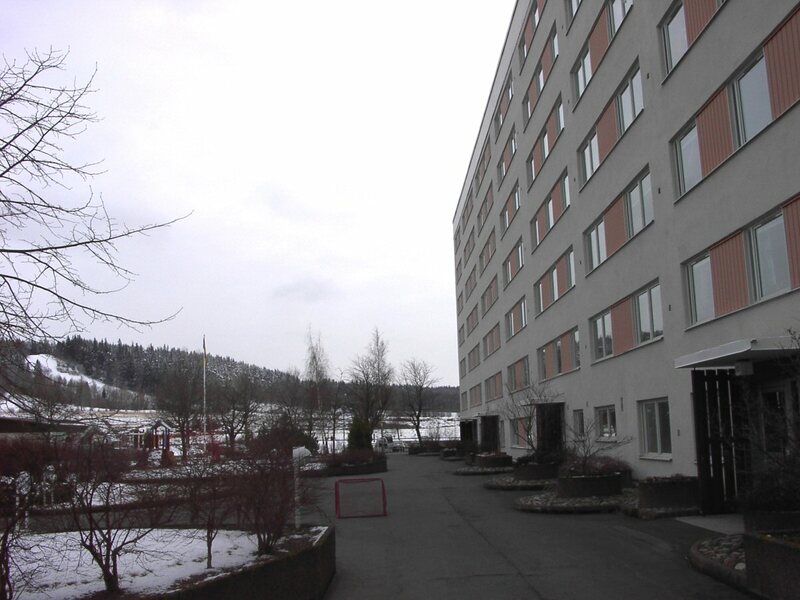 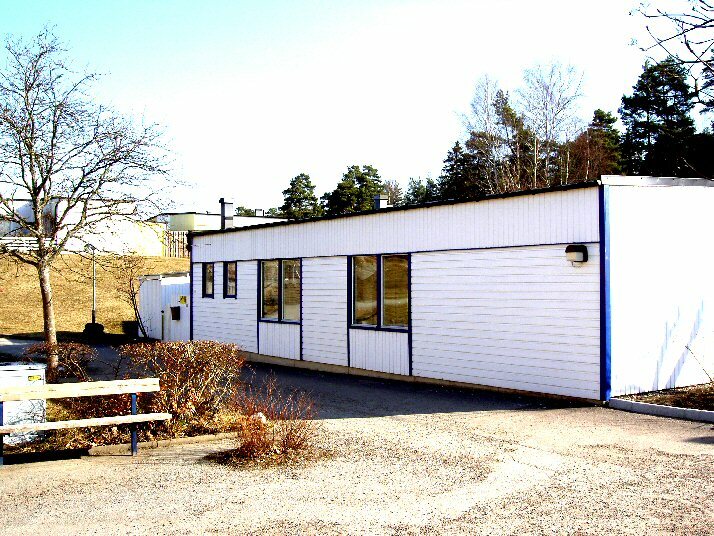 Björn stayed in Trädgårdsvägen. 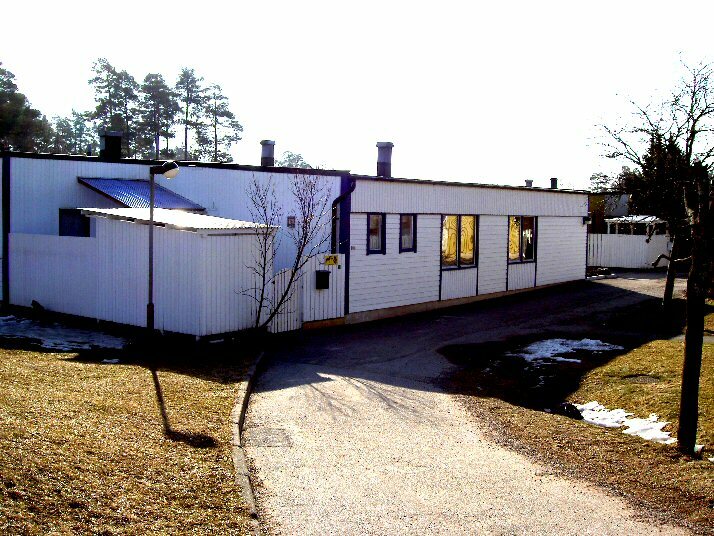 After the separation from Björn Agnetha moved to her own house in Jupitervägen. 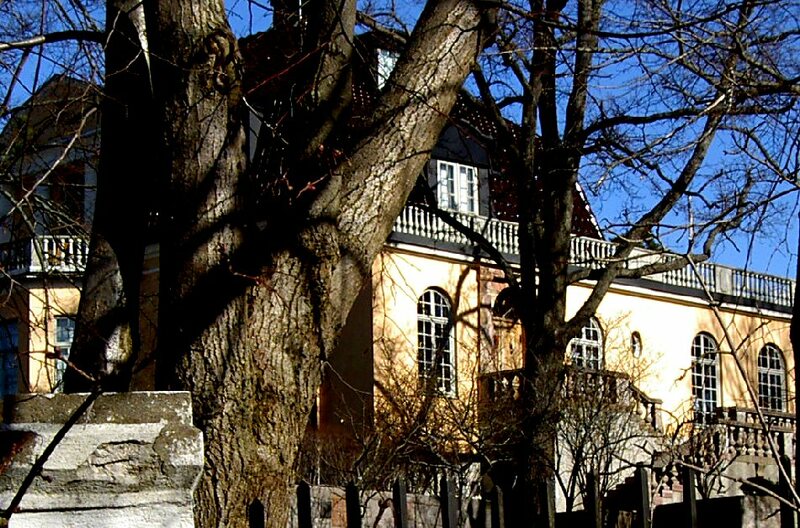 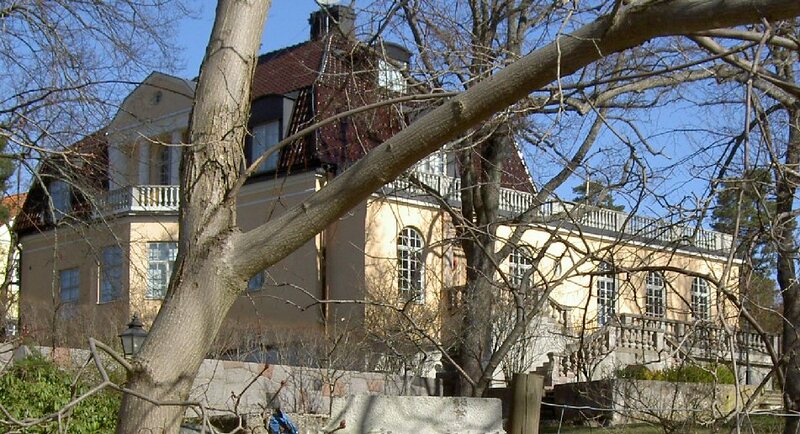 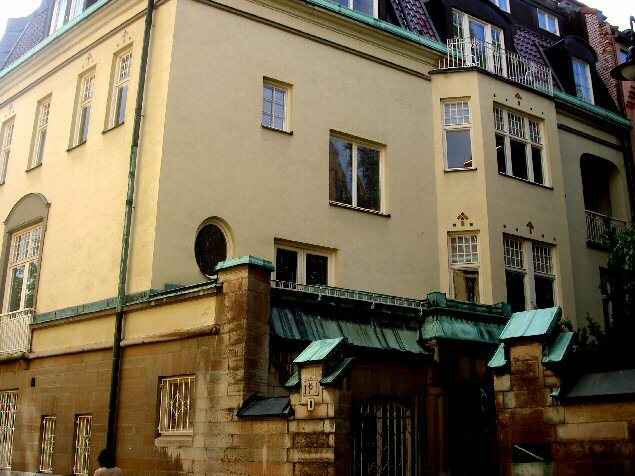 Stikkan Anderson owned a huge house called Villa Ekarne near Skansen on the island Djurgården in Stockholm. 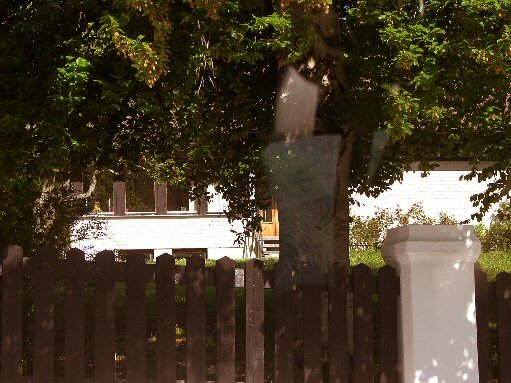 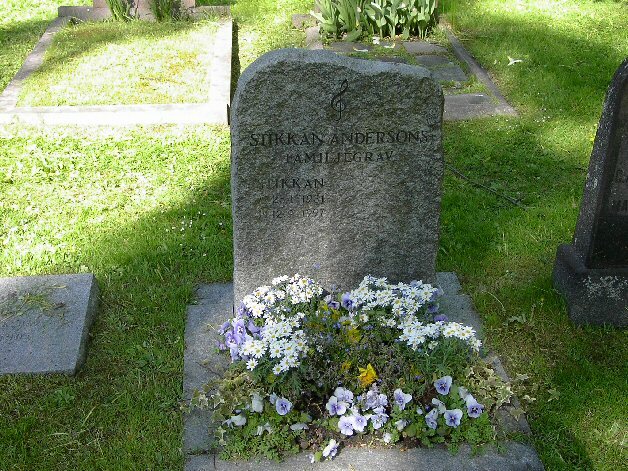 He lived there until his death in 1997. 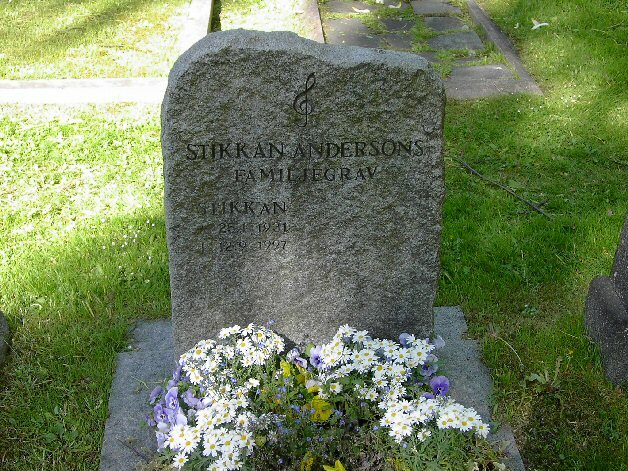 Stikkan Anderson, ABBA's manager is buried on a little cementary behind the Nordiska Museet on Djurgården in Stockholm. 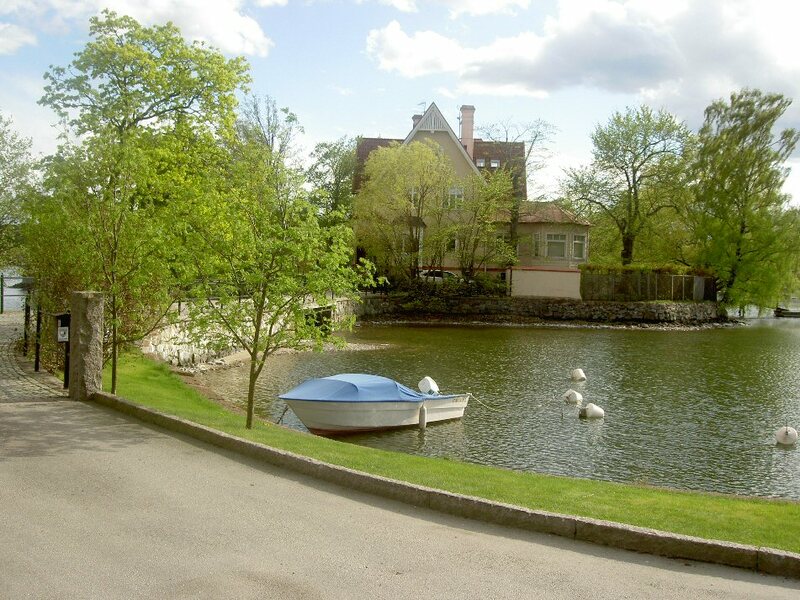 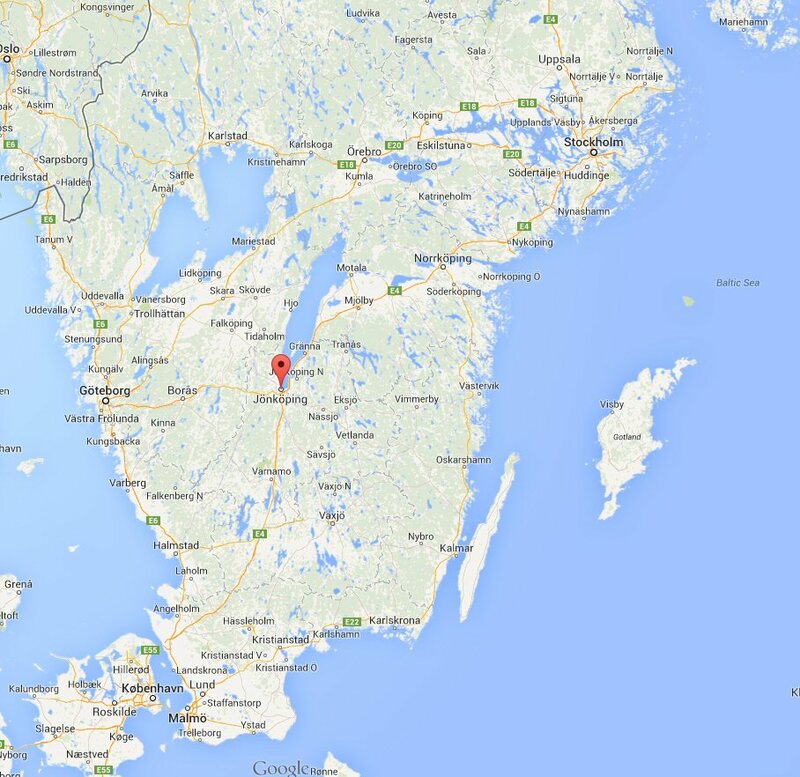 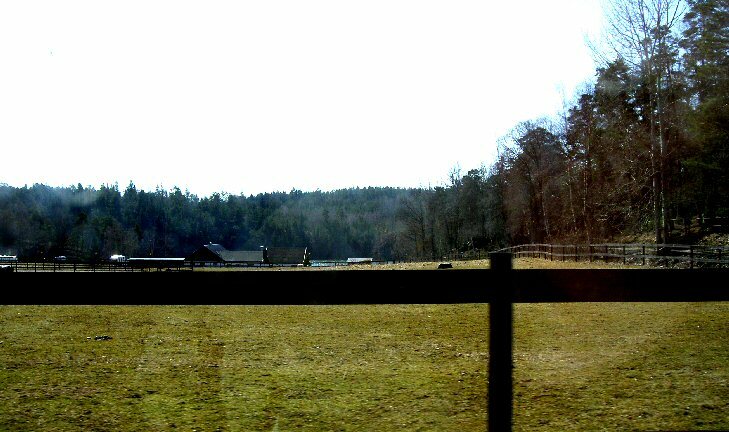 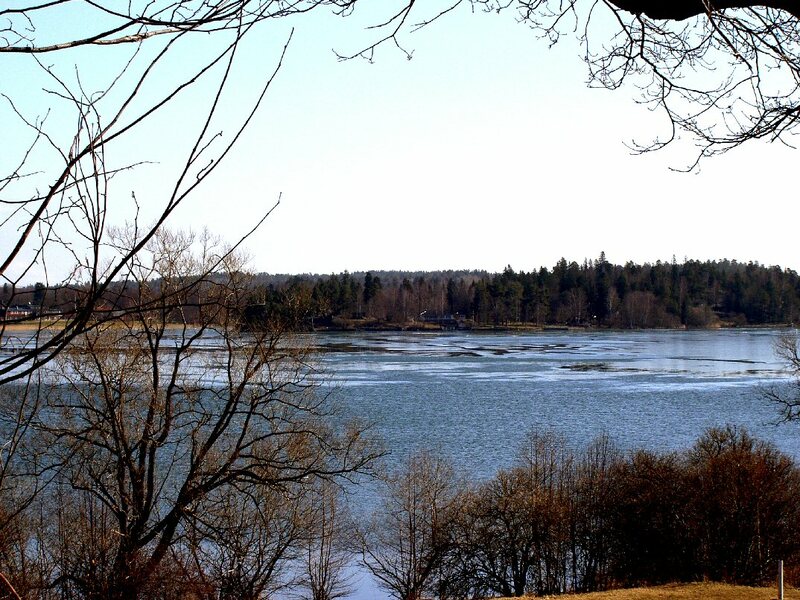 At the beginning of 1970s the both ABBA couples moved to the northern suburb of Stockholm Vallentuna. 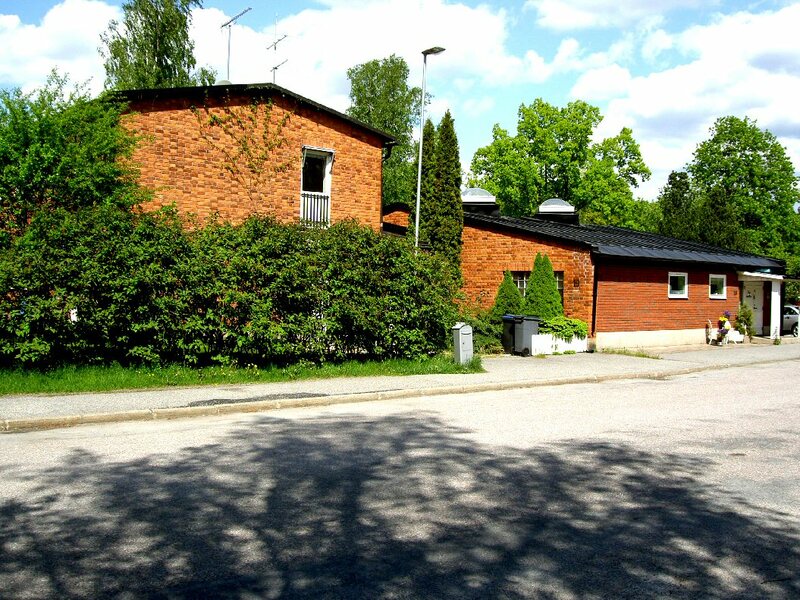 They lived until 1975 very near each other in the part of Vallentuna called Rosendal. 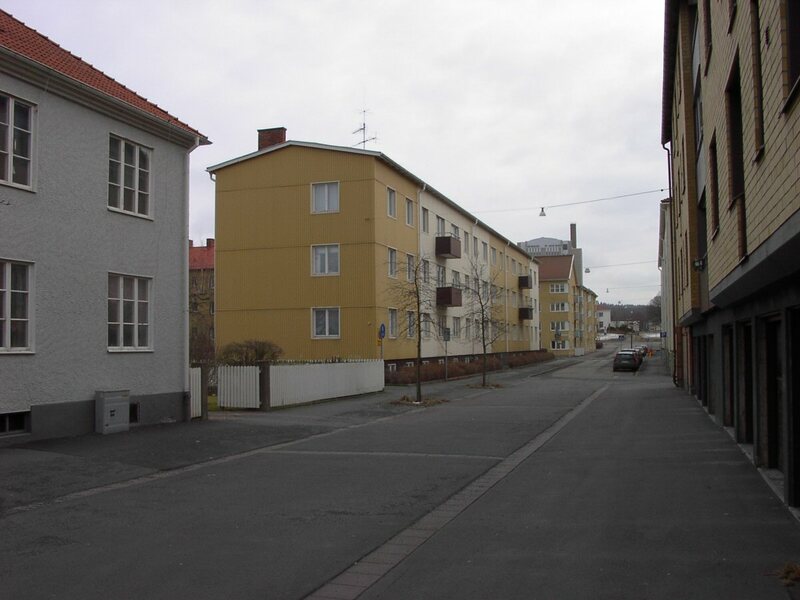 The district of Rosendal is quite boring and the houses stand very close each other. 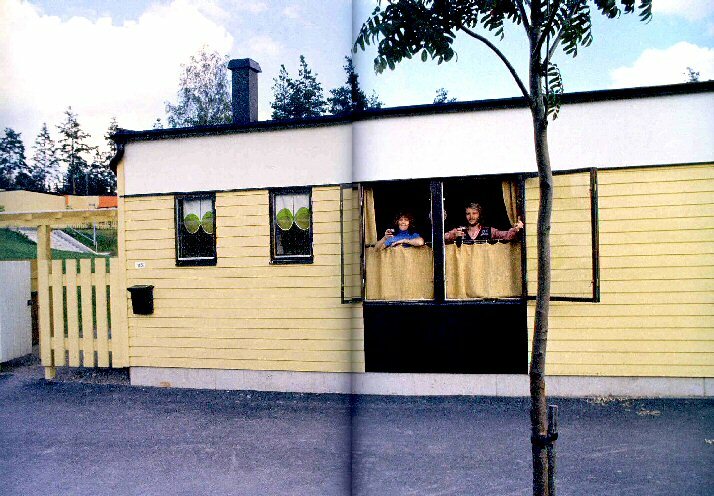 The colours of the houses today are different to July 1974 when the German Bravo photographer Wolfgang Heilemann took photo sessions there. 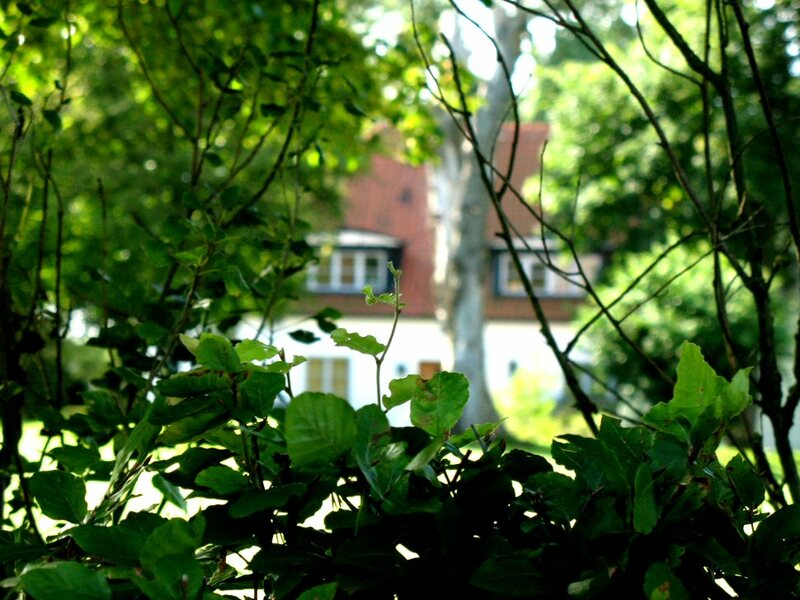 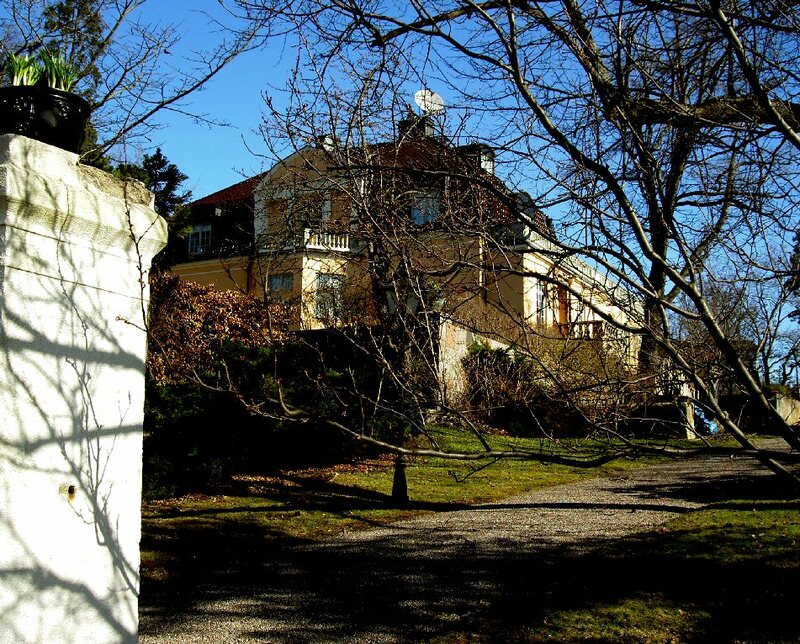 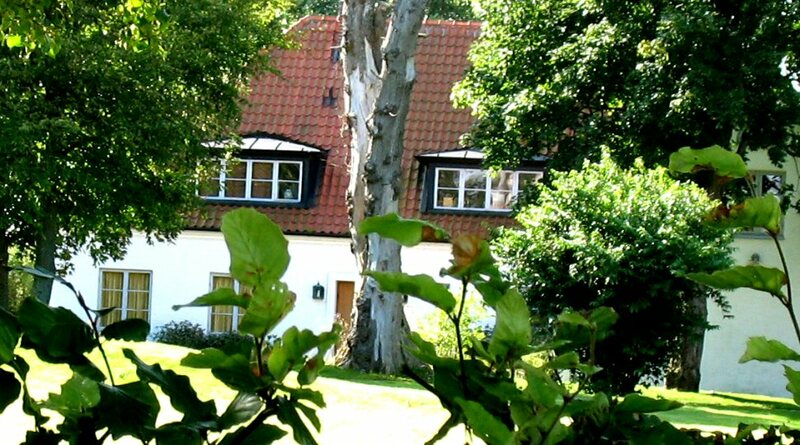 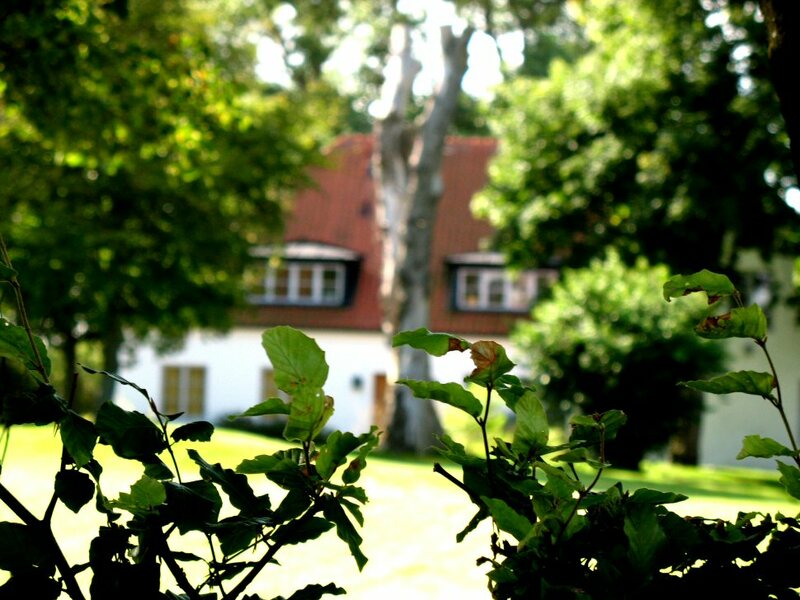 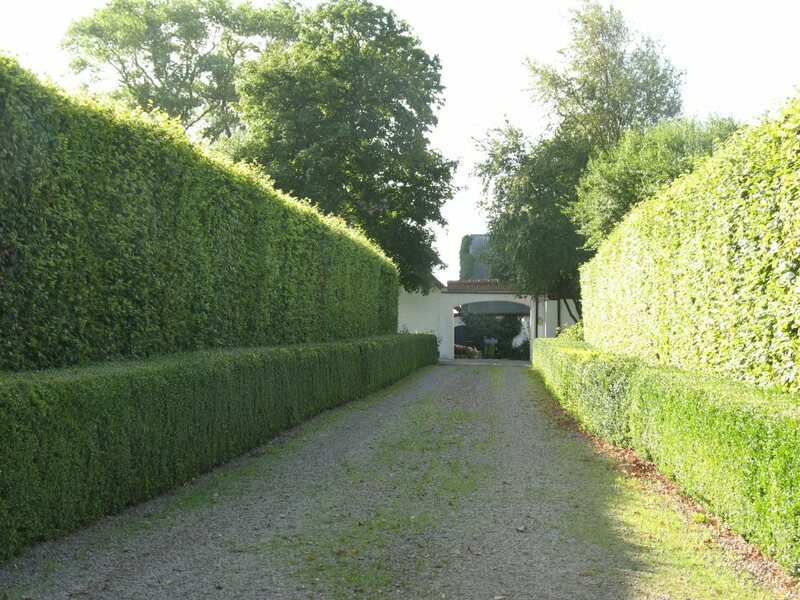 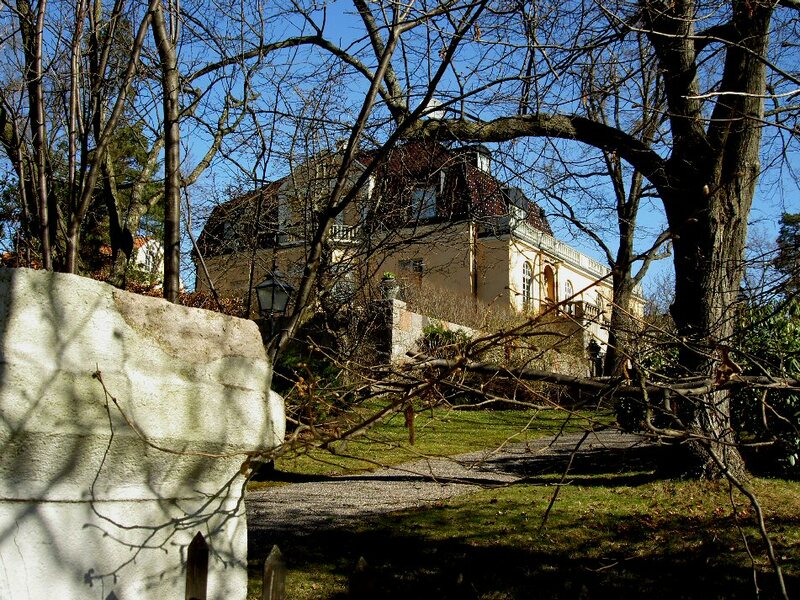 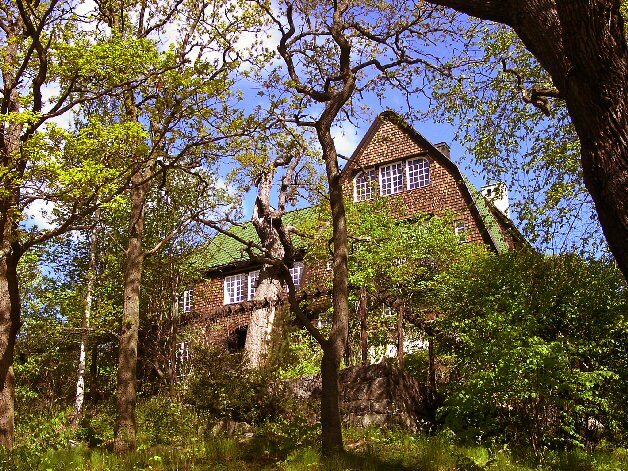 Björn and Agnetha had their house about 50 meters from Benny and Frida in Rosendal. 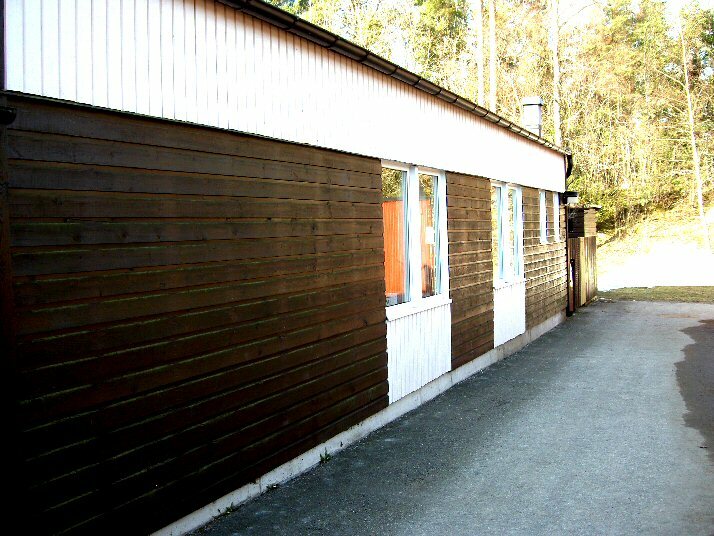 Even here the colour of the house has been changed. 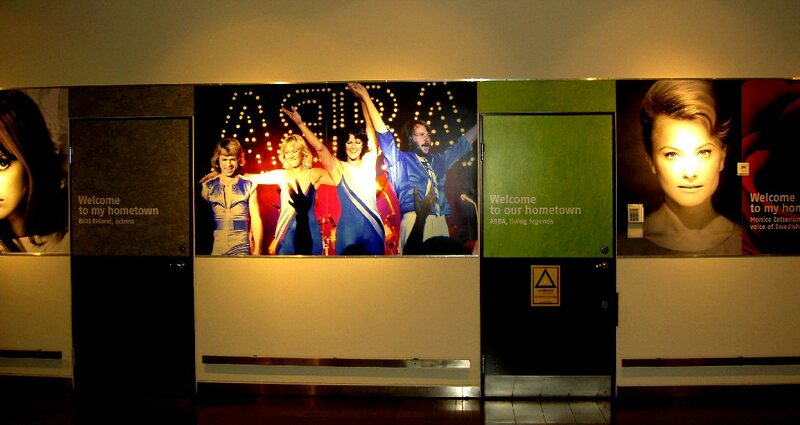 Probably one of the most important ABBA related places after Polar Music Studios in Stockholm. 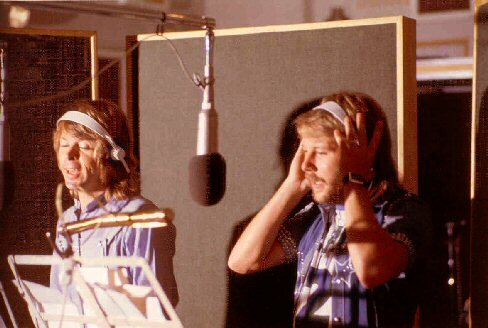 Michael B. Tretow started here his career as a sound engineer and his cooperation with ABBA. 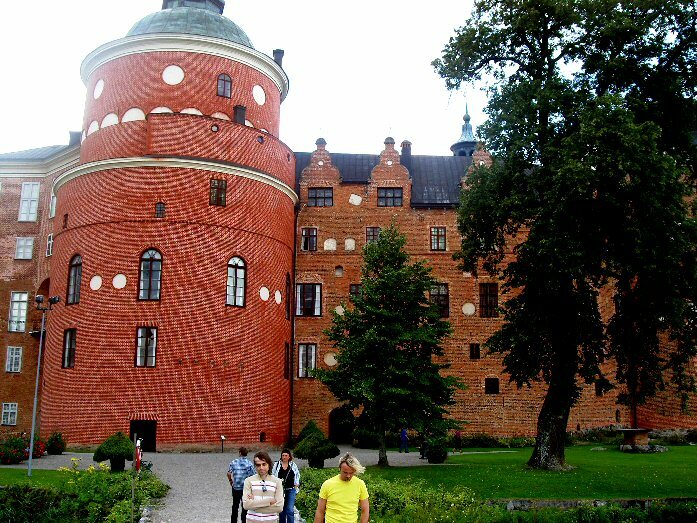 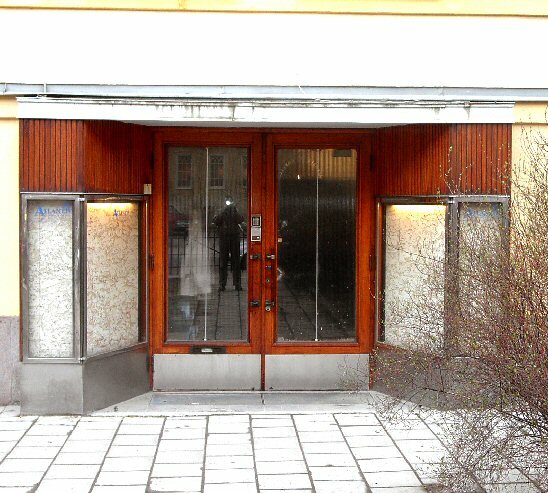 Following albums were recorded here: Ring Ring, Waterloo, ABBA, Arrival, The Album and My Colouring Book (by Agnetha). 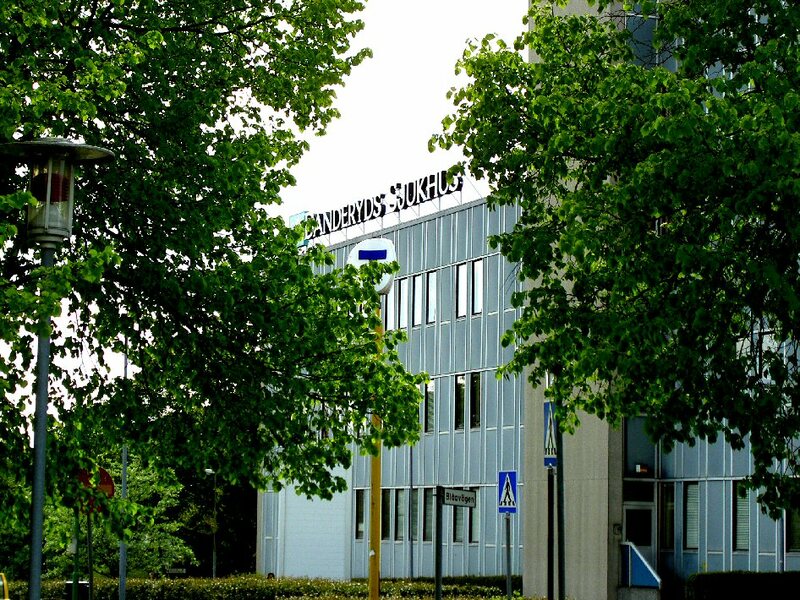 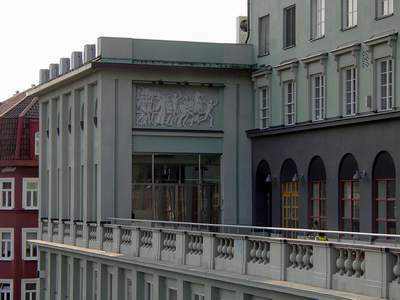 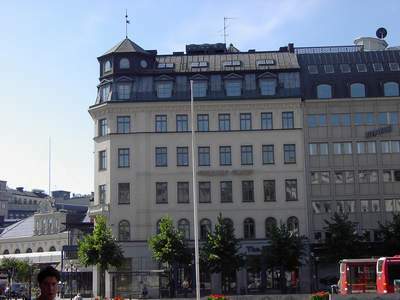 The studio is situated in Karlsbergsvägen 57 in Stockholm. 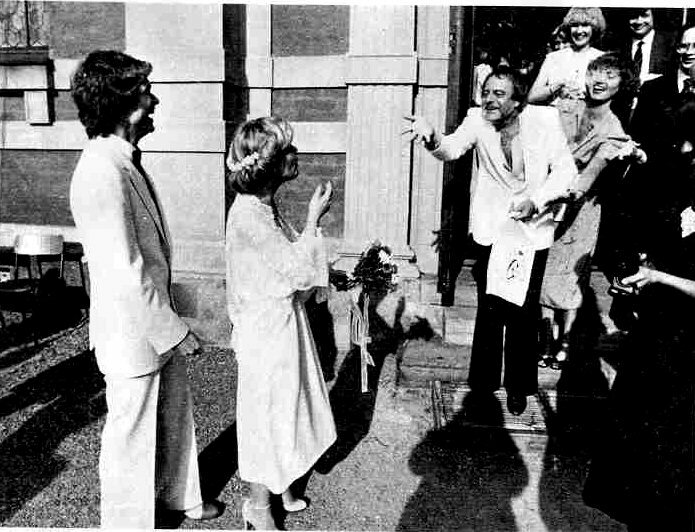 ABBA left the prints of their hands at "Liseberg" in Gothenburg. 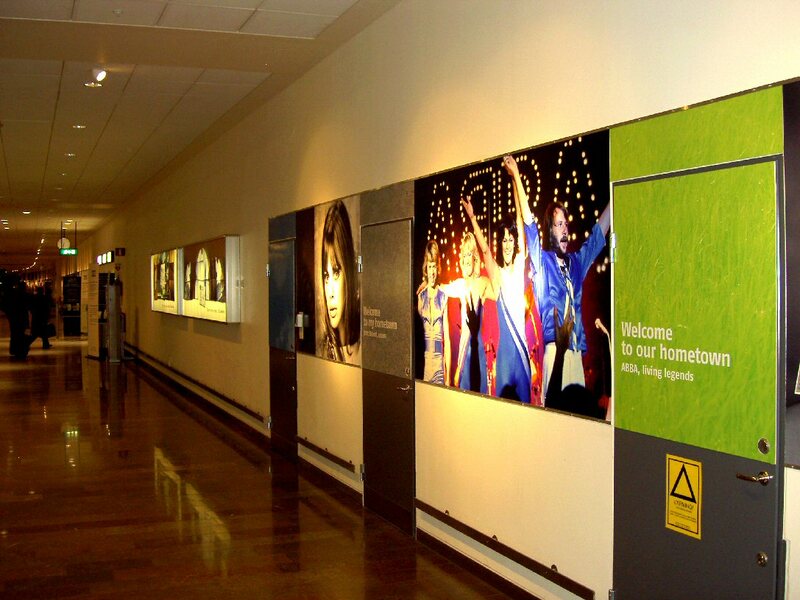 You can find them in the "hall of fame" among many other hand prints of famous people from all over the world. 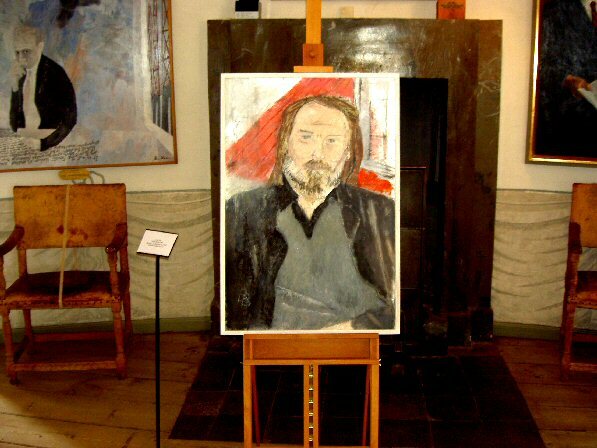 Benny Andersson is the first former member of ABBA whose portrait is exhibited in the gallery of celebrities at Gripsholms Slott in Mariefred in Sweden. 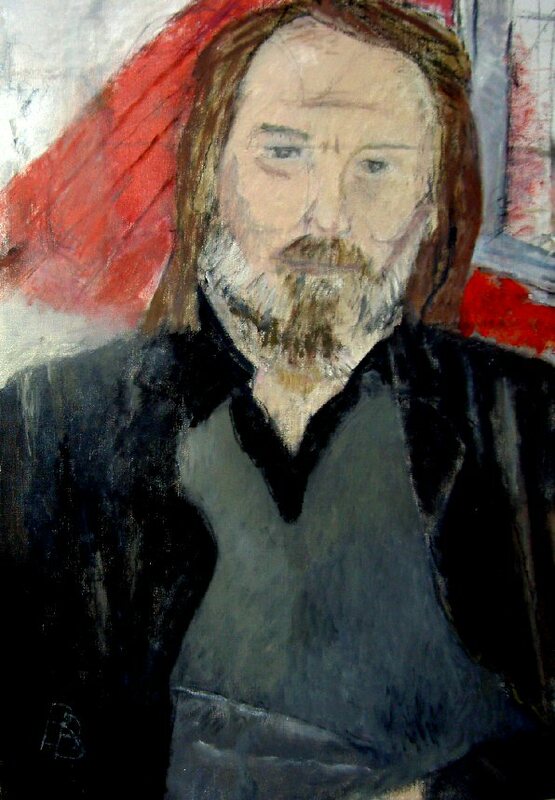 The portrait was painted by well-known painter Birgitt Broms. 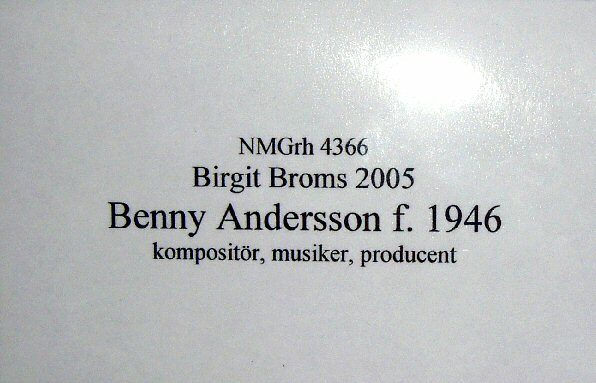 Benny himself is a great fan of Broms and owns some of her paintings. 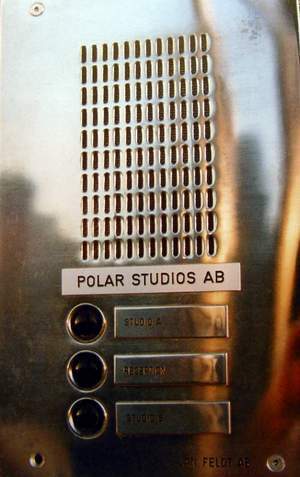 Polar Studios in Stockholm. 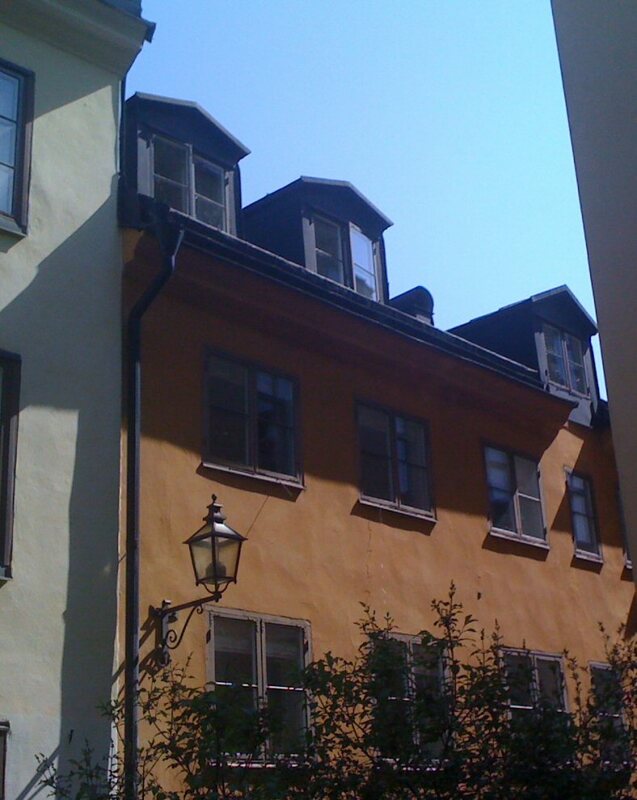 The adress Sankt Eriksgatan on the Kungsholmen island. 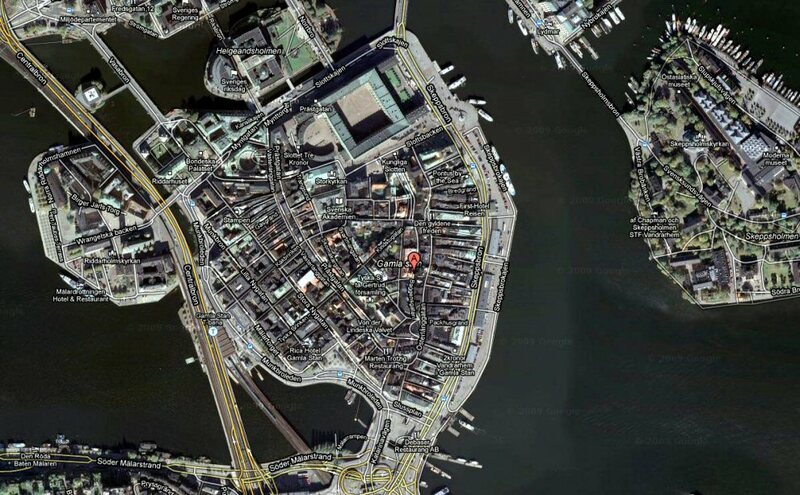 Easy to find. 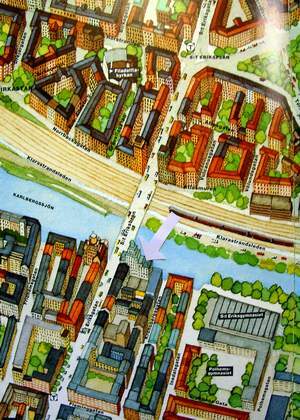 Take the underground green line to Sankt Eriksplan or Fridhemsplan. 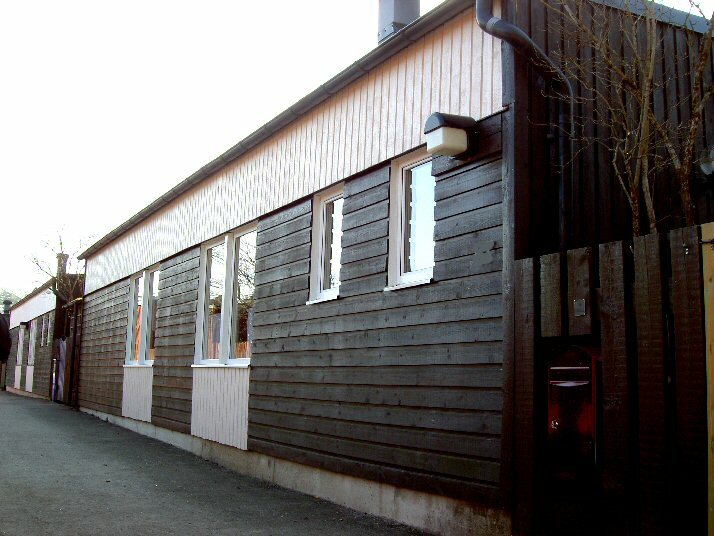 The studios were closed down on May 1, 2004. 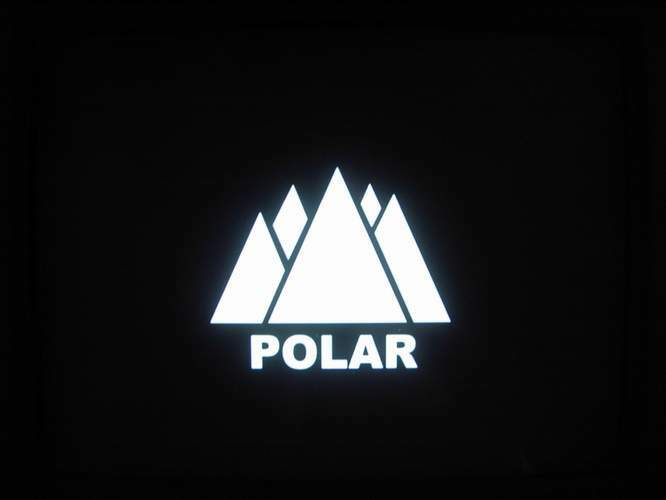 Polar Music Studios locals are used for muscle-subculture nowadays as a horrible gym "First Class" has been opened there. 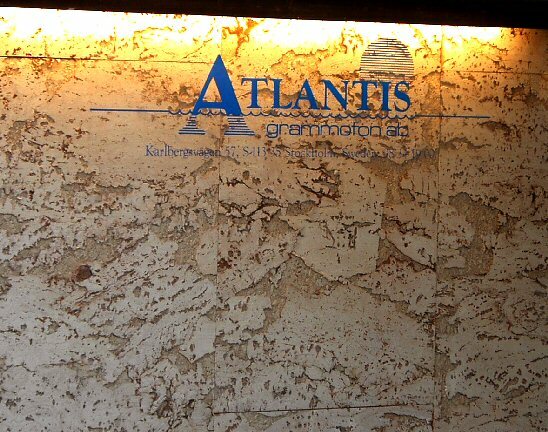 Still there are some traces after the glory times. 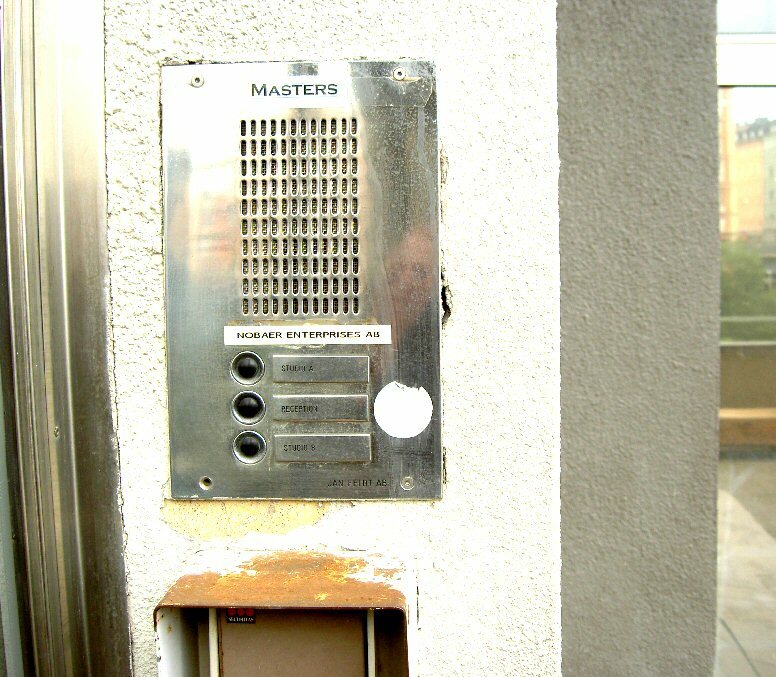 You can still see the Polar Music logo and there is still the old ring bell near the entrance. 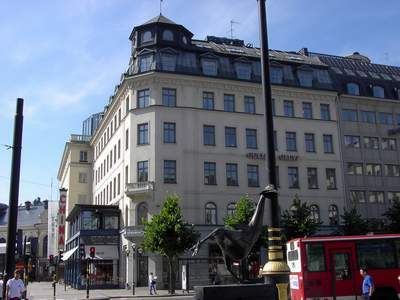 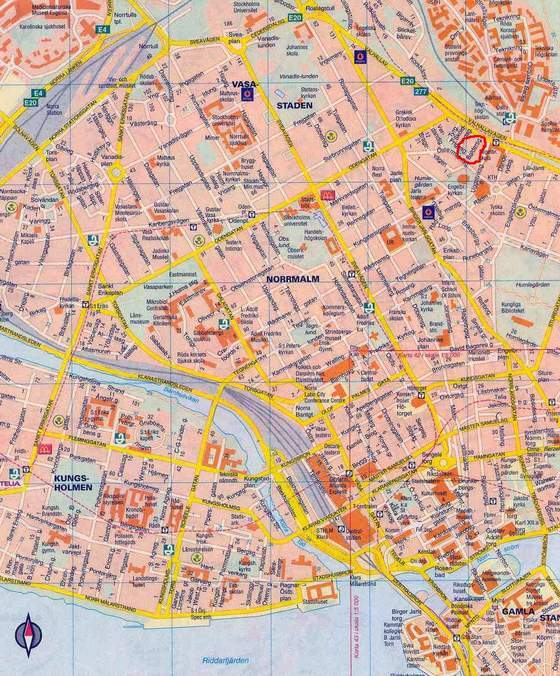 The Polar Music offices moved to Hamngatan 11 in the city center on November 9th, 1981. 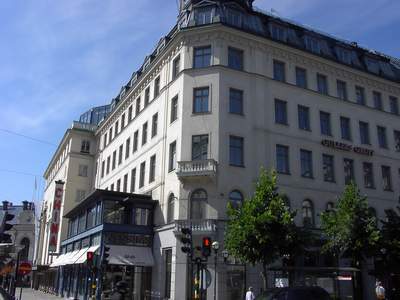 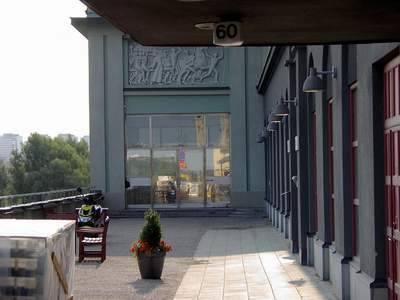 Polar Music had its headquarter on Hamngatan for more than 10 years. 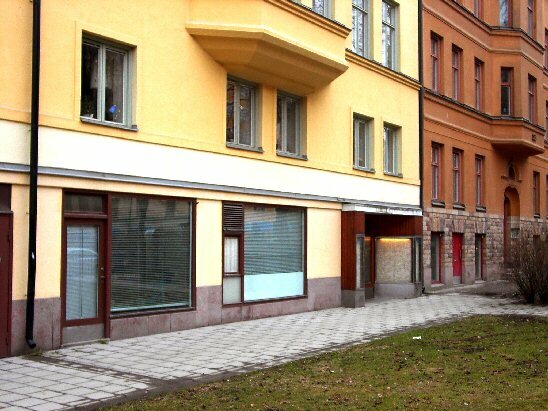 ABBA's headquarter until 1981 was situated in the big house in Baldersgatan 1 in the part of Stockholm called Östermalm. 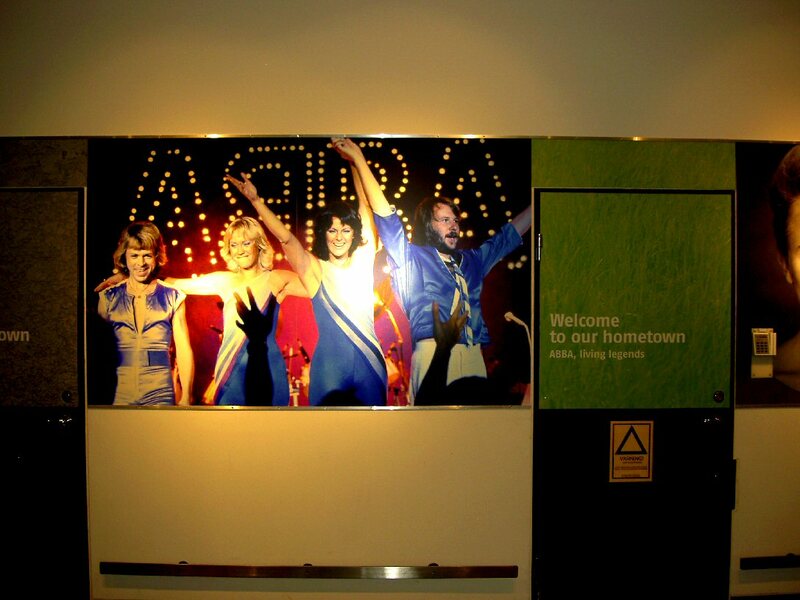 The Musikmuseet in Stockholm has a corner devoted to ABBA and their music. 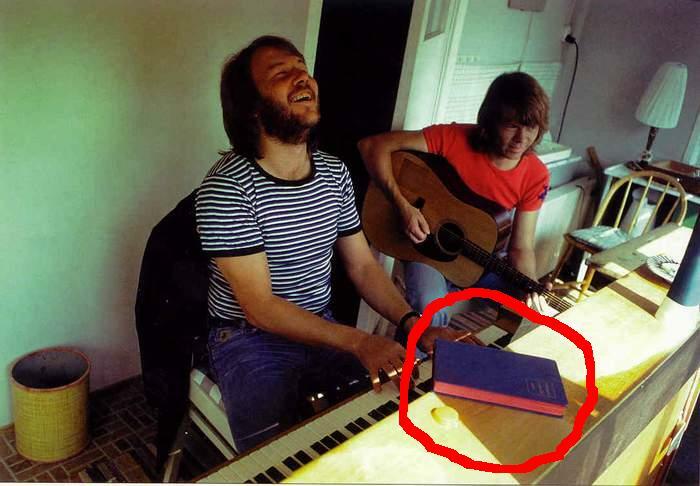 The piano which belonged Benny in 1974 can be seen there as well as some scene outfits and Björn's guitar. 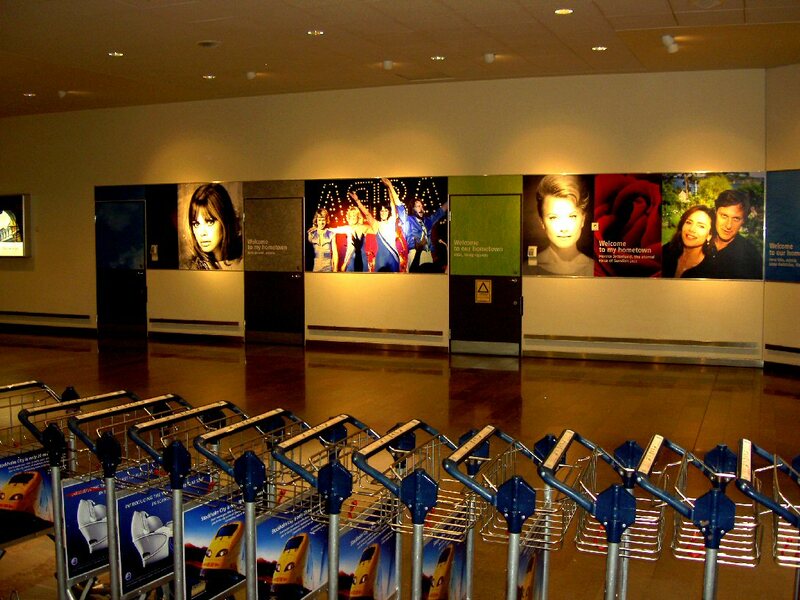 The Arlanda airport outside Stockholm opened its own Hall of Fame in 2005 in the arrival hall in Terminal 5. 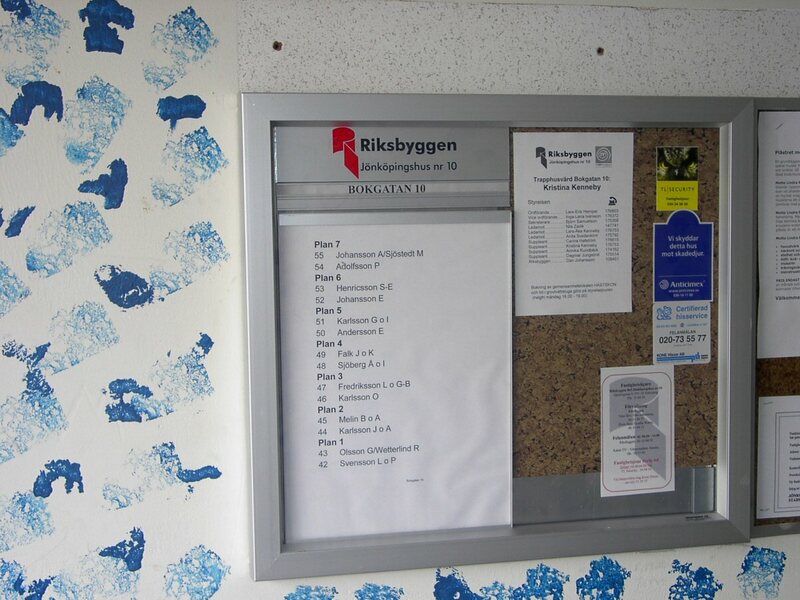 Several big posters of world-known Swedish celebrities are displayed on the long wall. 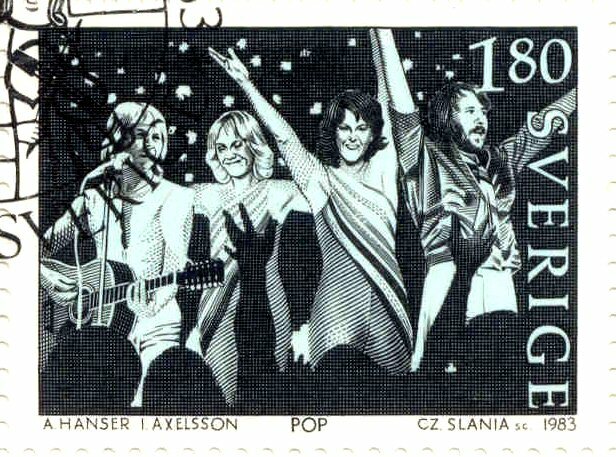 ABBA are presented as "living legends" with a well-known shot from the 1979 tour taken by Anders Hanser. 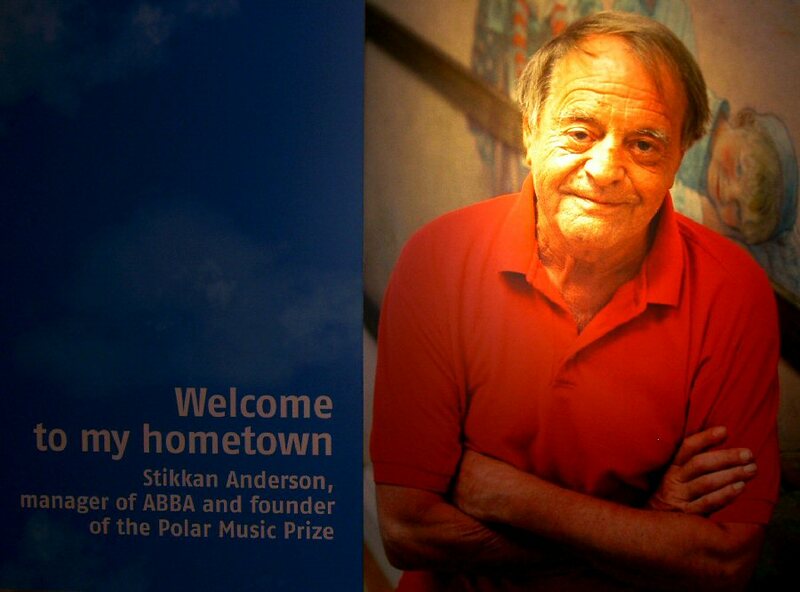 Even a nice poster of ABBA's manager Stikkan Anderson is displayed. 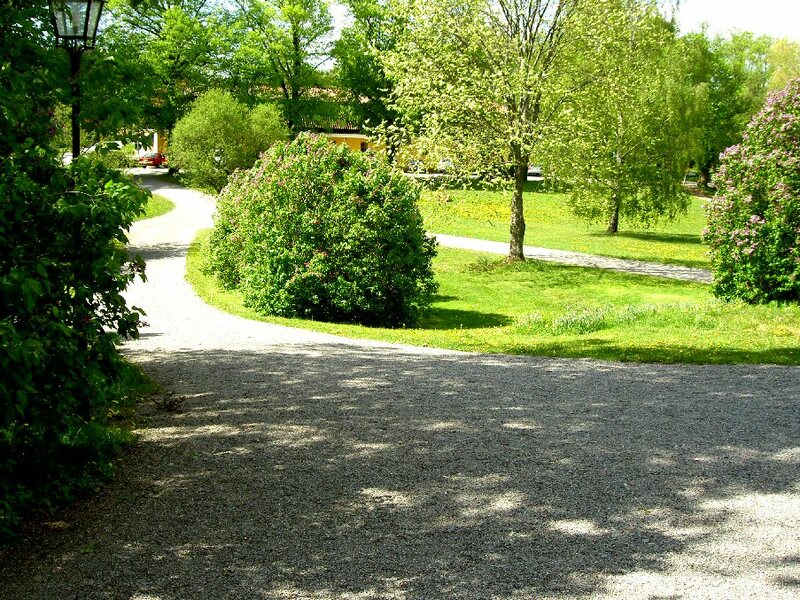 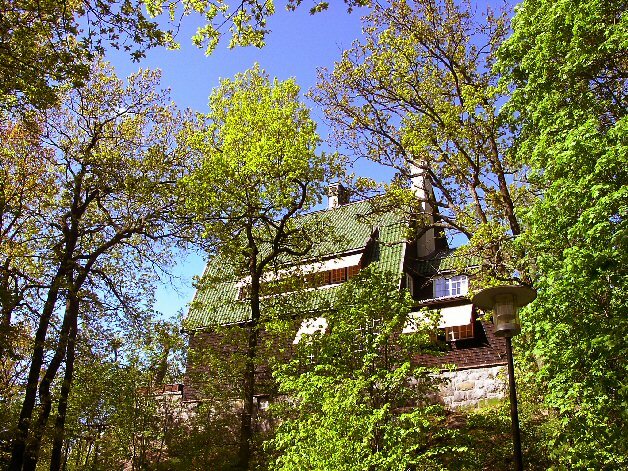 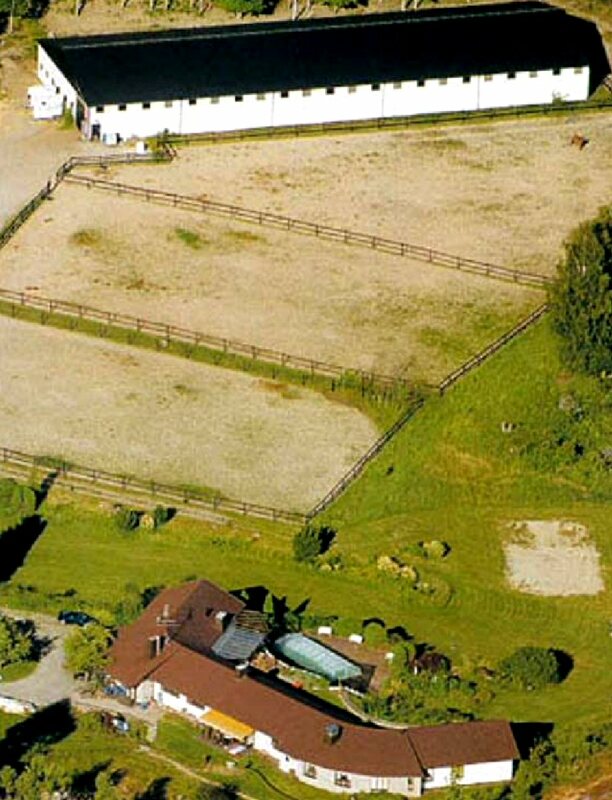 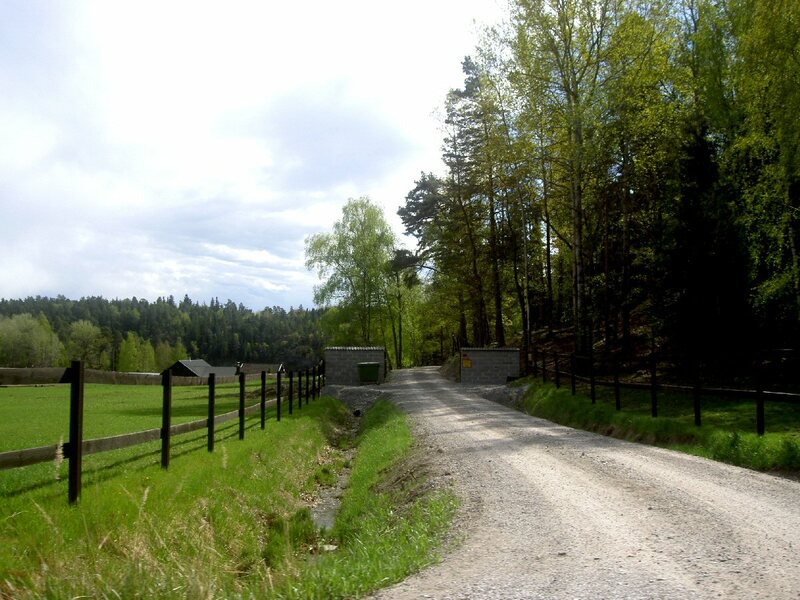 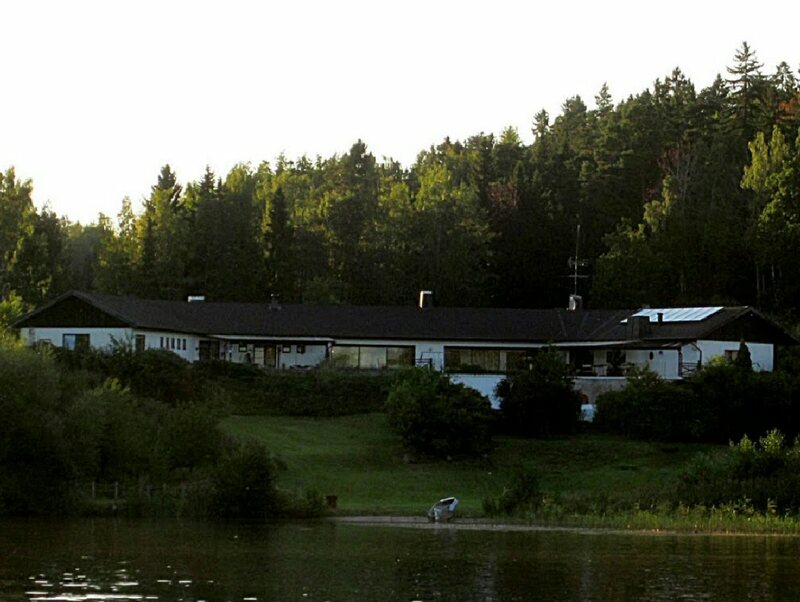 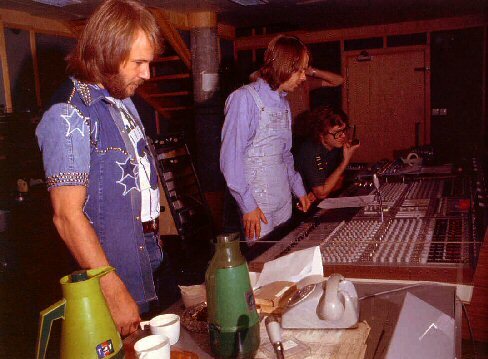 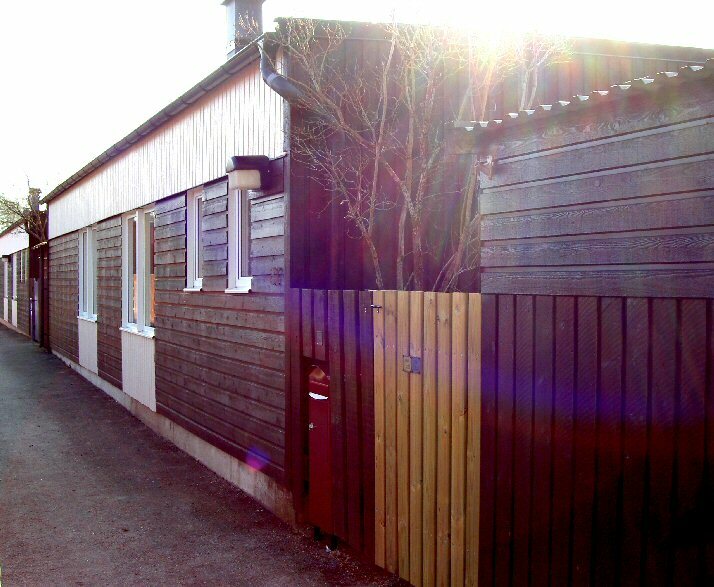 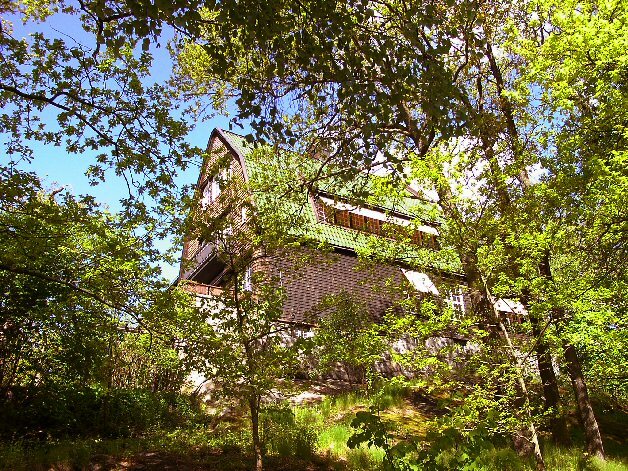 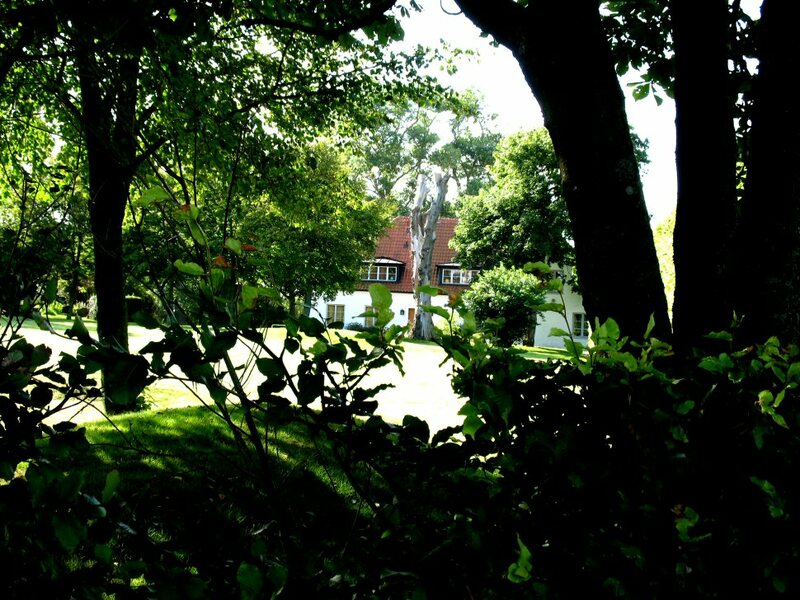 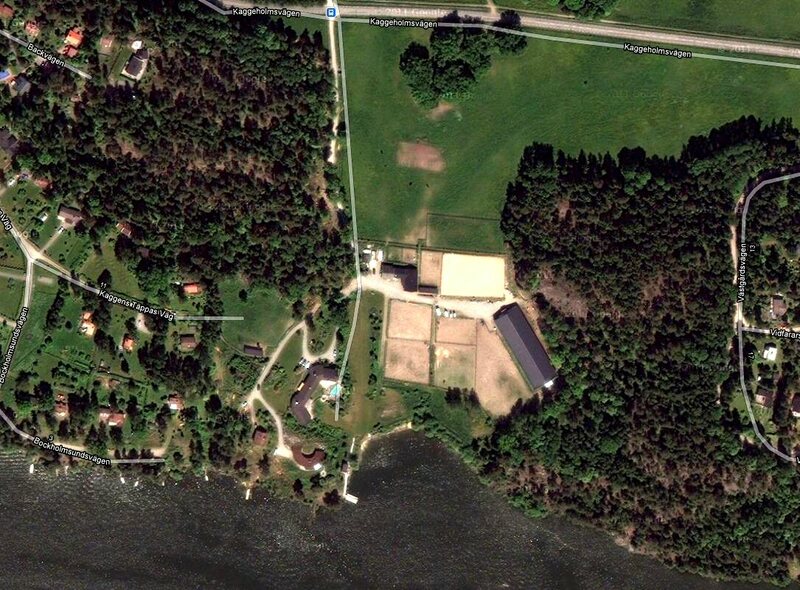 Many of ABBA songs were recorded In Glen studio in Stocksund outside Stockholm. 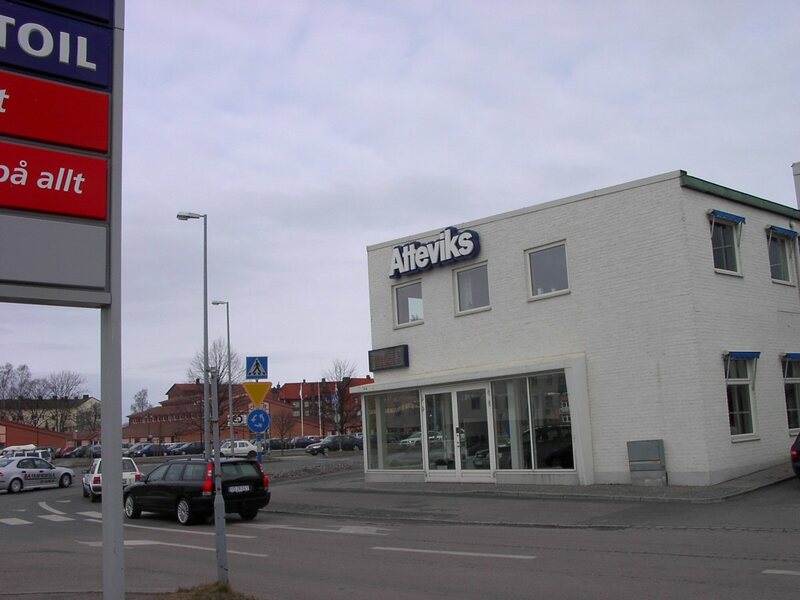 Even Agnetha recorded some of her solo material there. 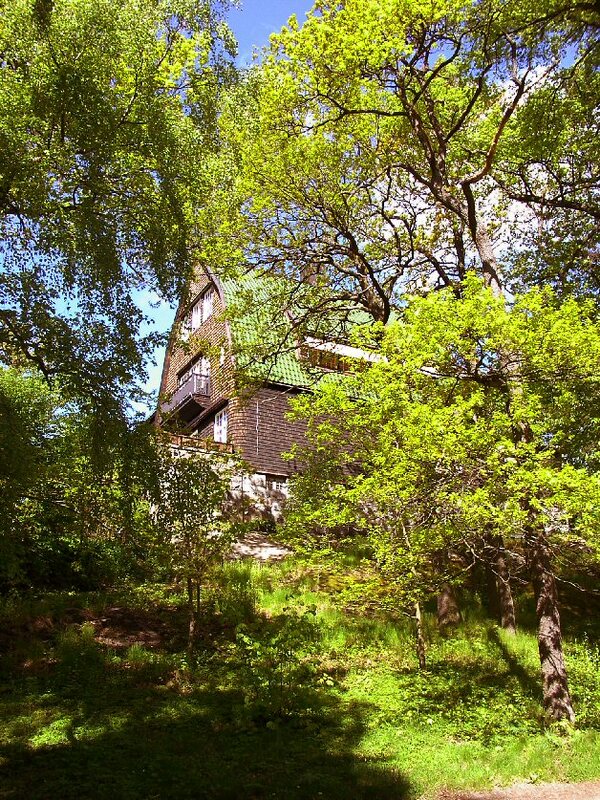 Some of the songs recorded in Glen Stduio: Ring Ring, songs for Agnetha's album "Elva kvinnor i ett hus", So Long, Man in the Middle, SOS, Hey Hey Helen, Rikki Rock'n'Roller, I've Been Waiting for You, Bang-A-Boomerang, Intermezzo No 1, Crazy World, Rock Me, Medley, Dancing Queen, Fernando, Thank You For The Music. 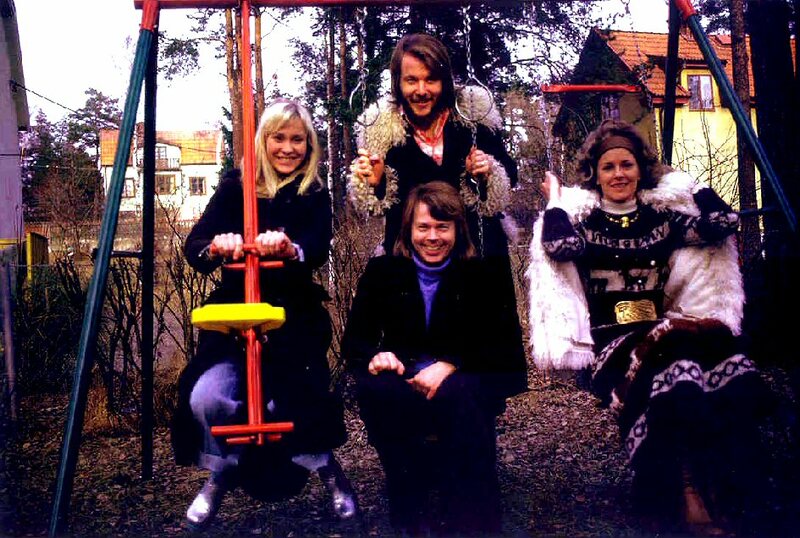 In the autumn 1974 lots of pictures were taken both in the studio and outside in the garden while ABBA recorded their third album "ABBA". 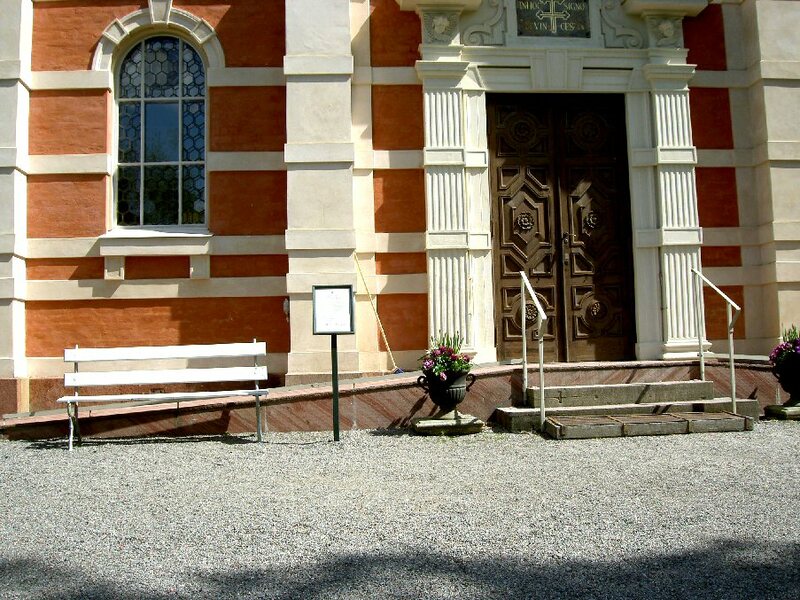 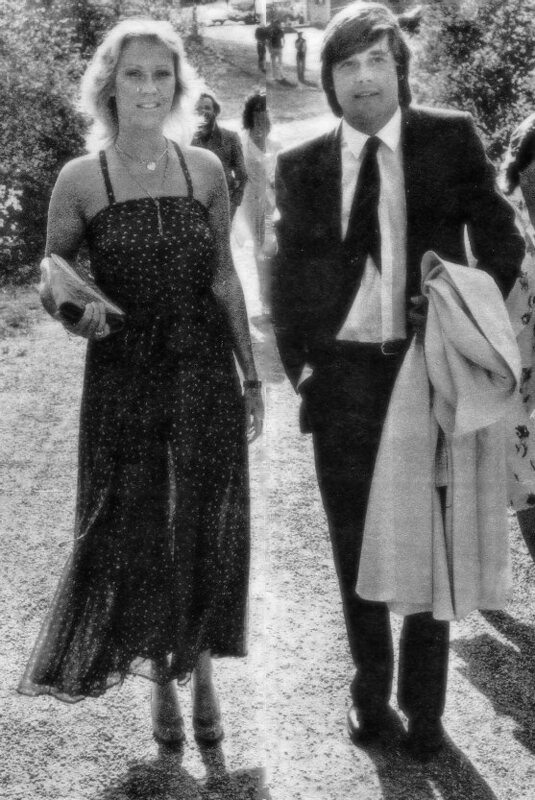 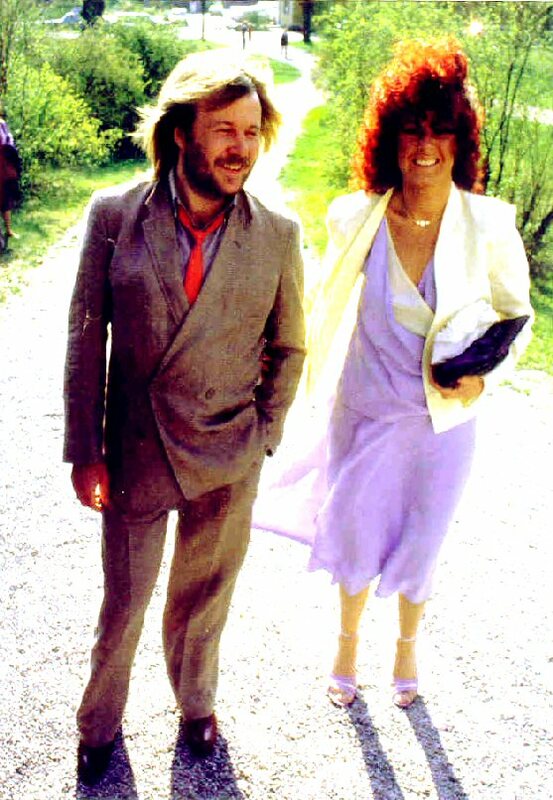 On May 19th, 1980 all ABBA family including all members of ABBA gathered in the Ulriksdal church in northern Stockholm to attend the wedding of Görel and Anders Hanser. 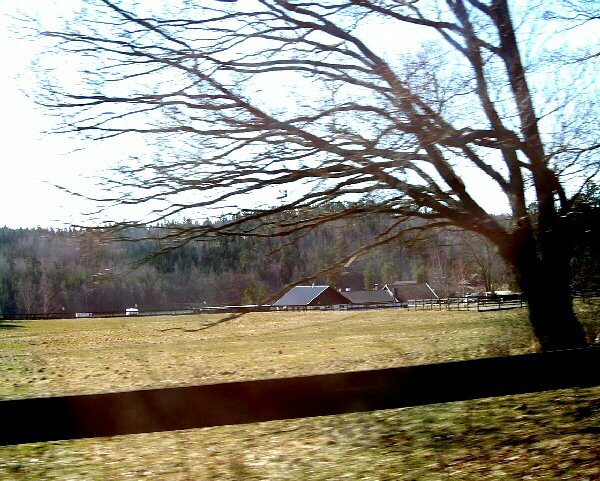 Lots of photos were taken that day. 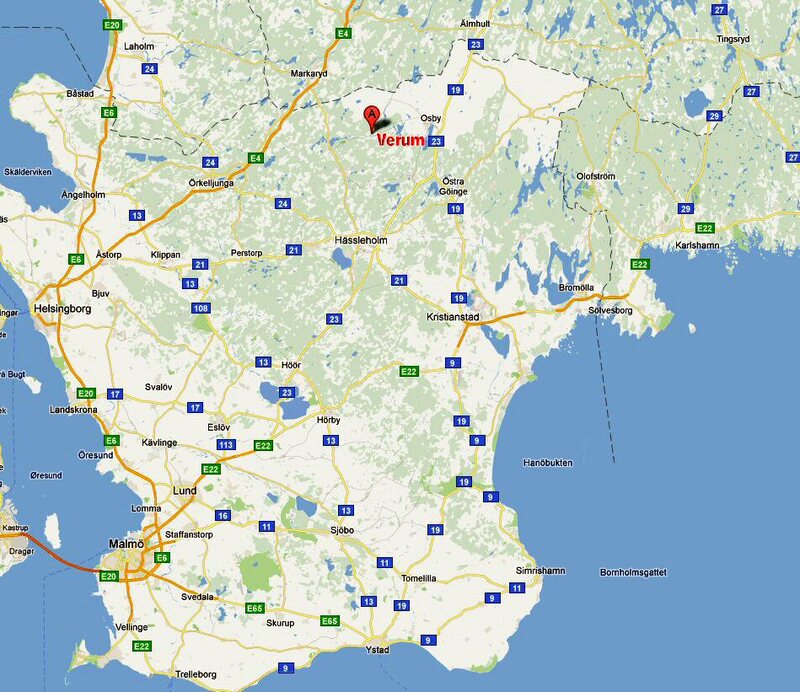 Frida owns in Sweden a property in Scania (Skåne) just a couple kilometers from the city of Landskrona (about 50 km north of Malmö). 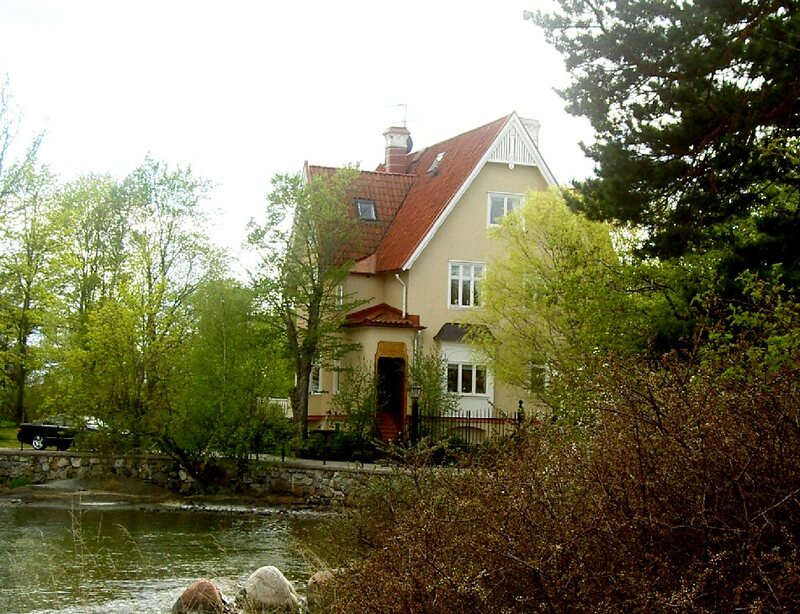 She lives here when she is in Sweden. 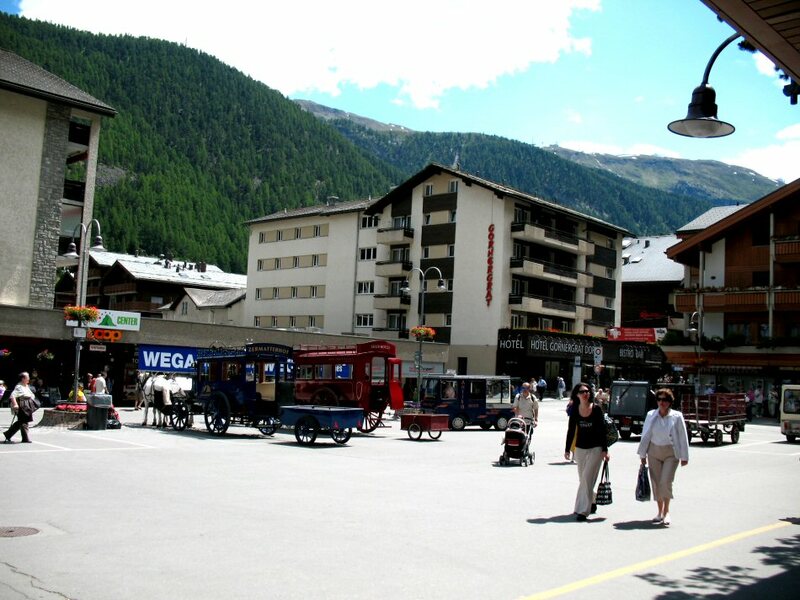 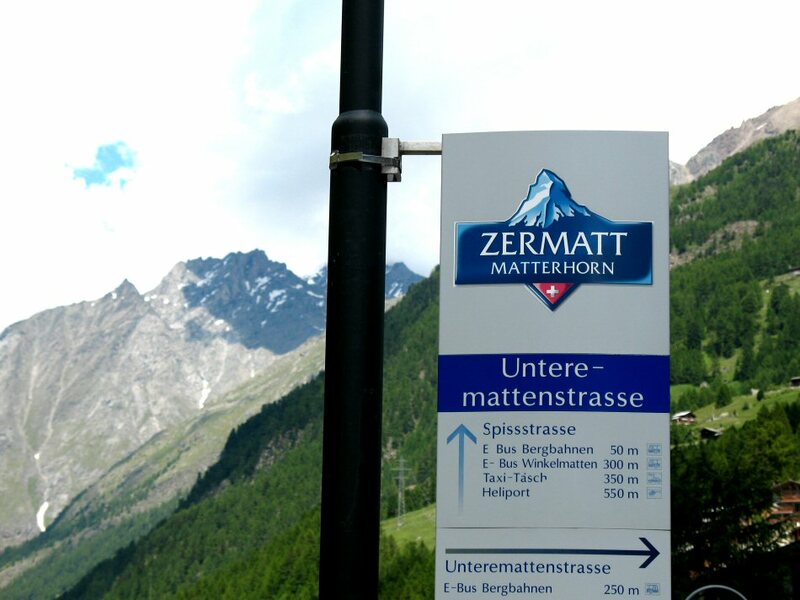 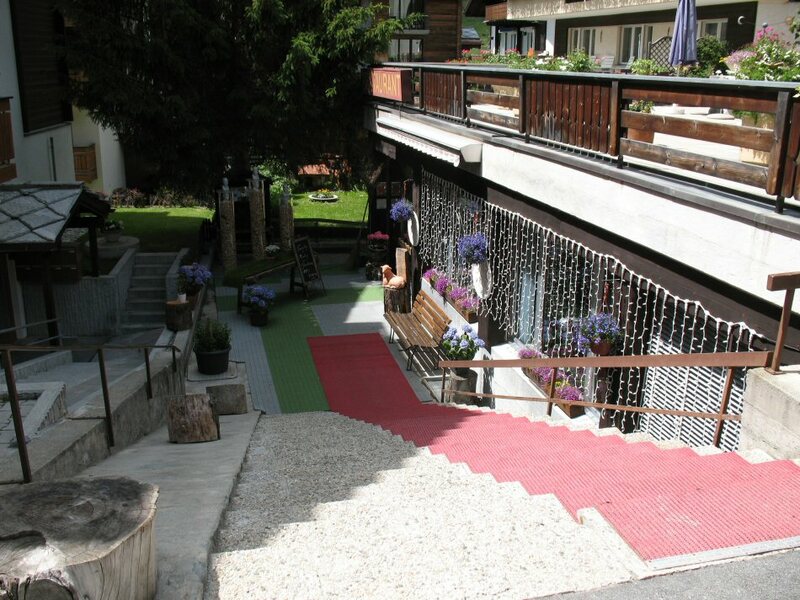 She even owns an apartment in Zermatt (Switzerland) (see above). 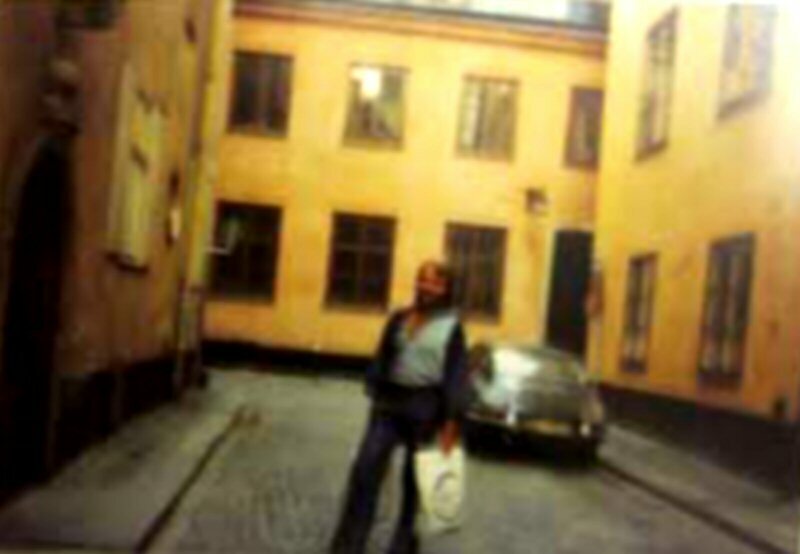 Frida and Benny lived in the middle of 1970s in a flat in the Old Town - Baggensgatan 21.